I recently received the good news that L1049H Super Constellation HI-542CT survived Hurricane Maria, which devastated Puerto Rico on September 20, 2017. 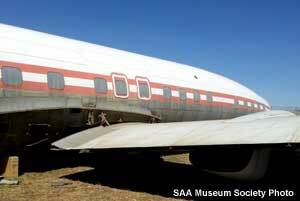 The aircraft was abandoned at Aguadilla Airport (BQN) after being damaged by a runaway DC-4 on Feb 3, 1992. 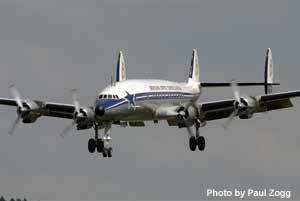 AMSA owned the aircraft but, with the 1994 FAA edict banning Dominican registered aircraft from flying to U.S. 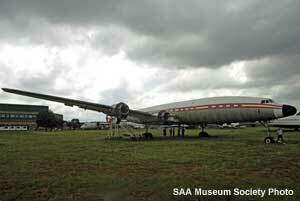 Airports, there was little incentive to repair the Super Connie. 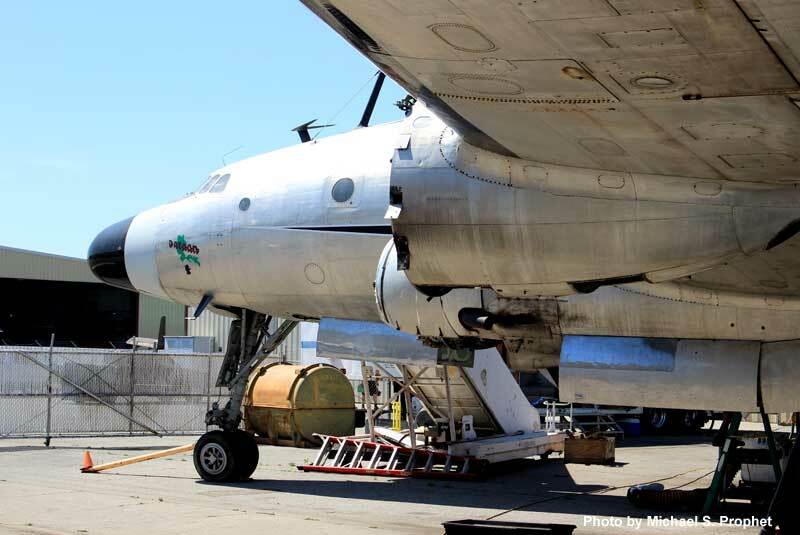 Over the past 25 years, the humid ocean climate has played havoc on the aircraft and its condition has steadily deteriorated. 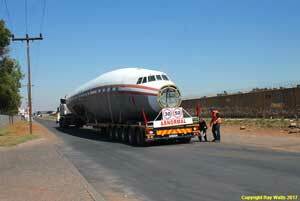 Airport construction forced a move a few years ago and it'scurrently parked in front of the Lufthansa Technik hangar. 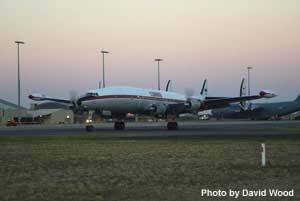 I’d like to thank Alan Stensland for his report and photo. 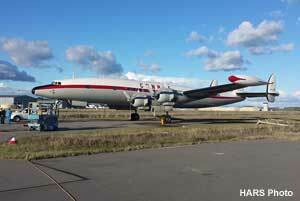 The Super Constellation Flyers Association has set up a secure page on their website, which will allow contributions for the repair of Super Constellation HB-RSC to be made by credit card. As of today, the organization has raised 1.09M Swiss Francs of the $2M that is required to complete the needed repairs. Status of the fundraising effort is tracked regularly on the SCFA Website. For additional information, check out the September 30th post on this website. 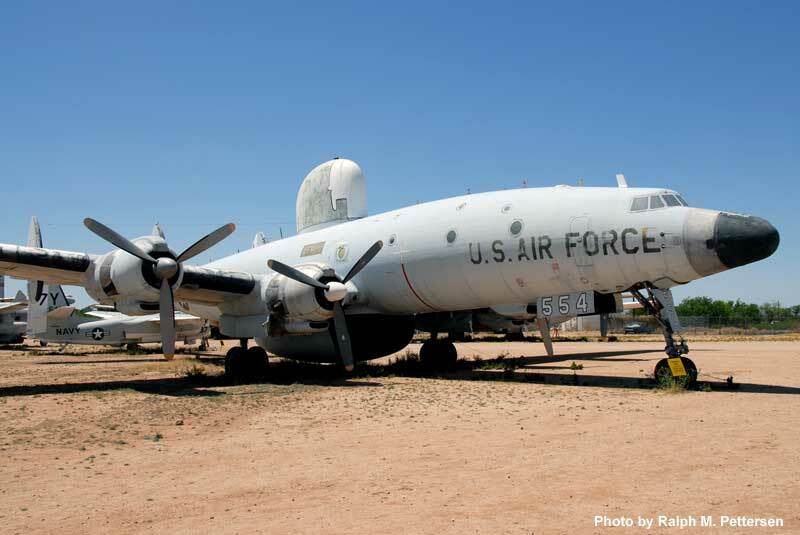 EC-121T 53-554 was put back on display at the Pima Air and Space Museum on October 20th after completion of a multi-month cosmetic restoration including a complete repaint. 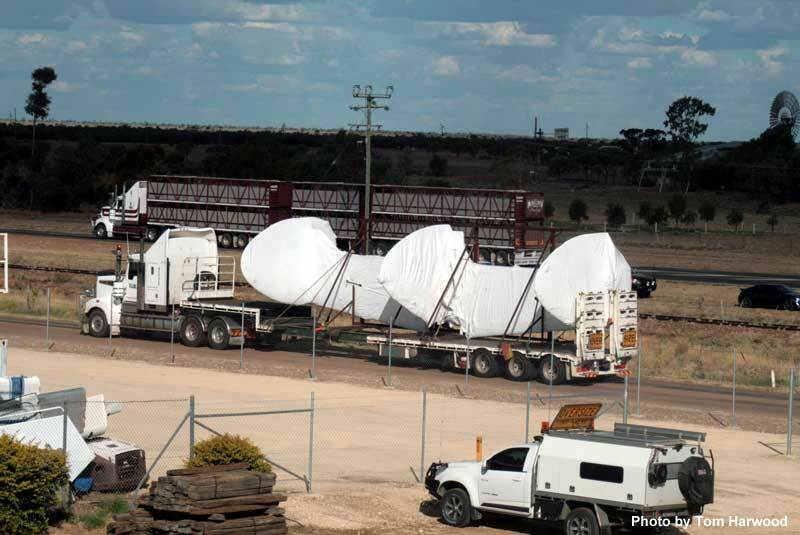 According to Bruce Dewald, who sent the below photos, he aircraft had been off-line and out of sight for five years, five months and twelve days! 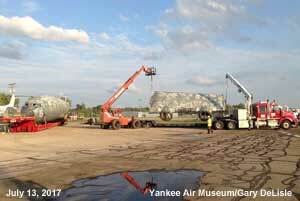 The restoration had been undertaken in the museum’s new “Super Shade” cover built to provide shade for outside restoration projects. Many thanks to Bruce for the report and photos. 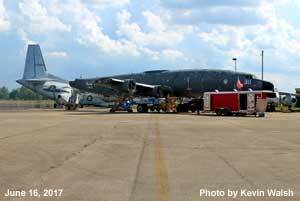 The long anticipated arrival of Castle Air Museum’s latest acquisition happened on the morning of October 7, 2017, when a caravan of Worldwide Aircraft Recovery trucks arrived at the museum carrying EC-121T 52-3417/N4257L. 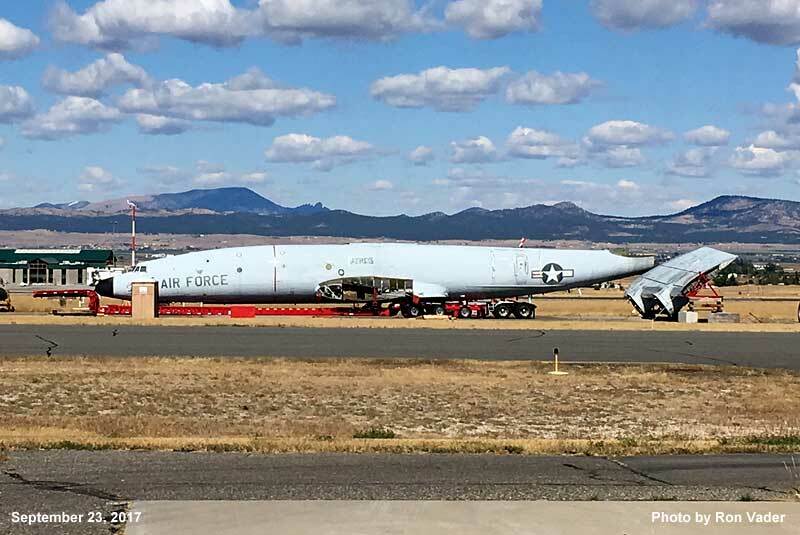 The aircraft had been disassembled by Worldwide in Helena, Montana and departed Helena for the museum in Atwater, California on October 1, 2017. 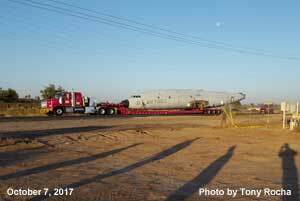 The Worldwide crew was led by Marty Batura, who also drove the truck carrying the aircraft’s 110 foot long fuselage section. 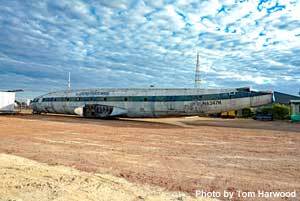 Upon arriving at Castle, Marty and his crew wasted no time and reassembly had been completed by October 20th. This is the second EC-121 that Worldwide has moved in the past few months so they are well versed in the disassembly, move and reassembly of EC-121 aircraft. 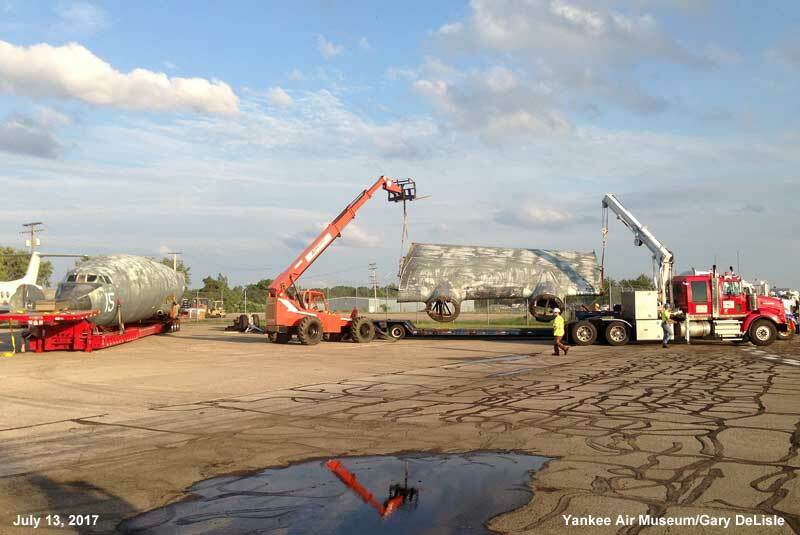 The first involved the move of EC-121K BuNo 141311 this past summer from the defunct Octave Chanute Aerospace Museum to the Yankee Air Museum in Ypsilanti, Michigan. 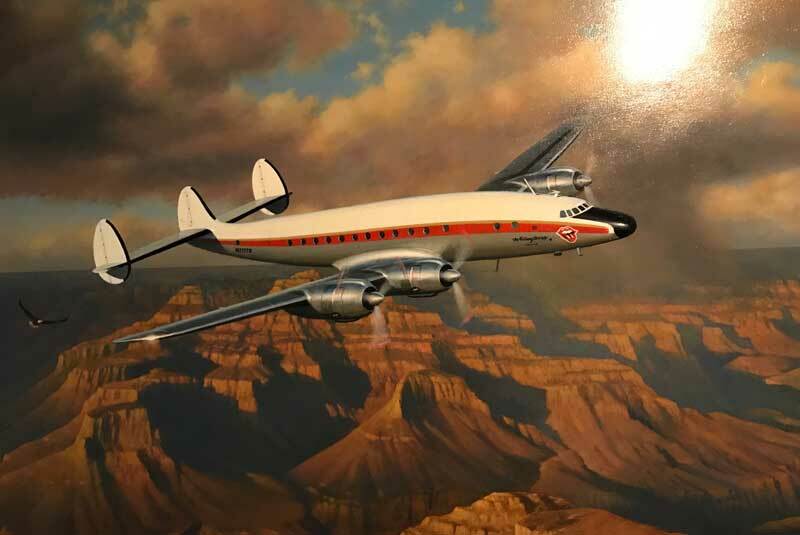 Tony Rocha, Castle’s curator and chief operations officer said that, with the exception of the dome, the aircraft’s exterior will be kept as is for the time being. 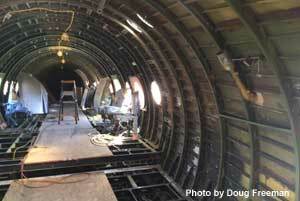 The nearly complete and original interior will be cleaned up and will be open to the public. 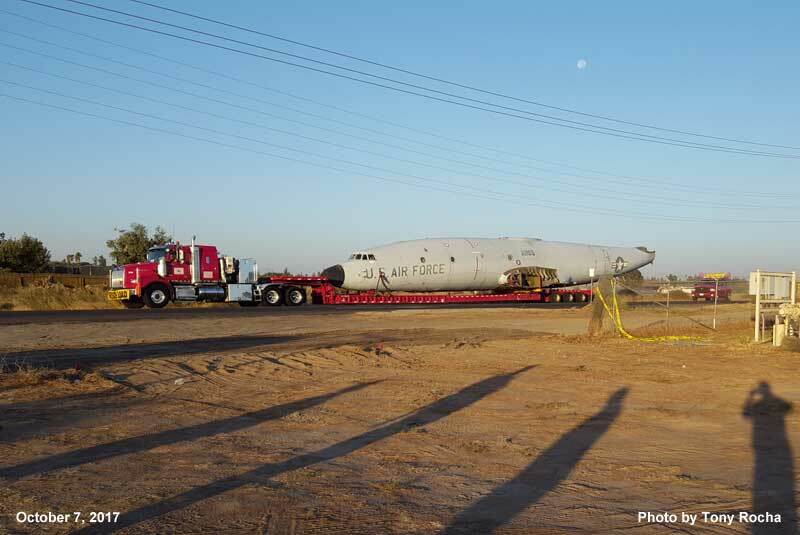 In addition to giving the Worldwide crew high marks for their efforts, Tony had high praise for both the California Highway Patrol and Atwater Police Department, whose officers provided critical support during the move. I’d like to thank Tony and Ron Vader for allowing me to use their photos. 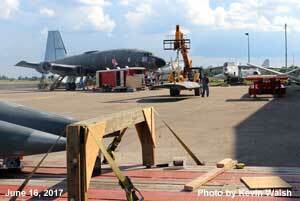 For additional information about the aircraft and the move, check out my August 26th and September 21st reports. 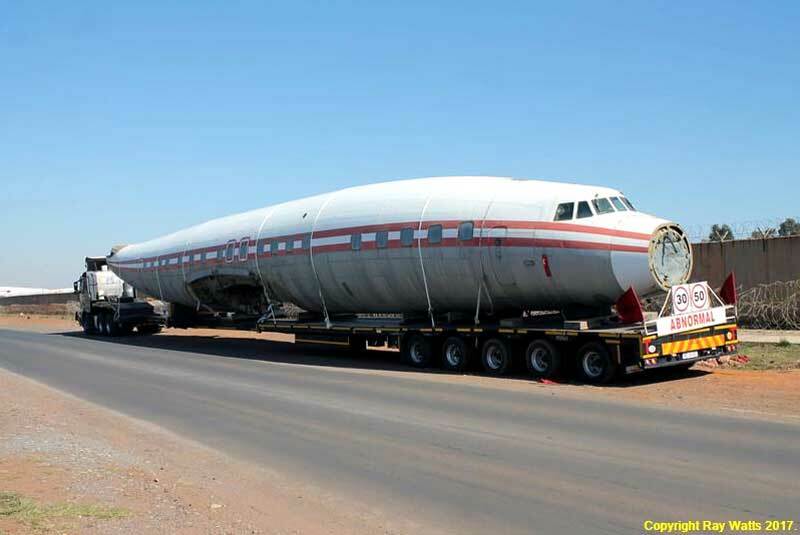 The fuselage of South African Airways Museum Society Starliner ZS-DVJ made its long anticipated roadtrip from OR Tambo Airport in Johannesburg to the museum’s headquarters at nearby Rand Airport on Friday October 13th. 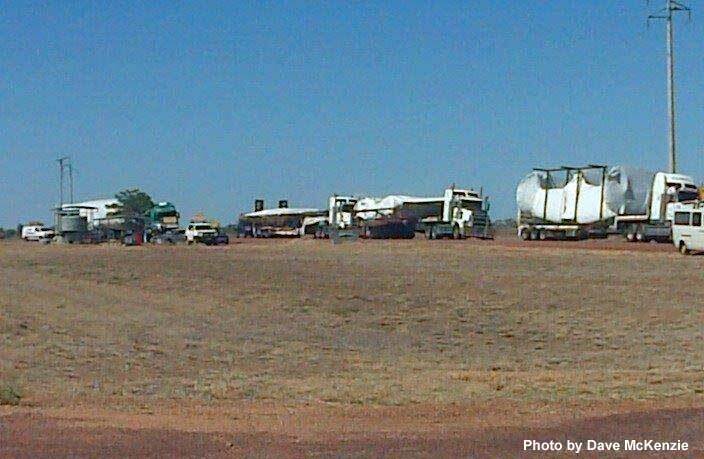 The move went well with the remainder of the aircraft hopefully being moved in the next couple of weeks. 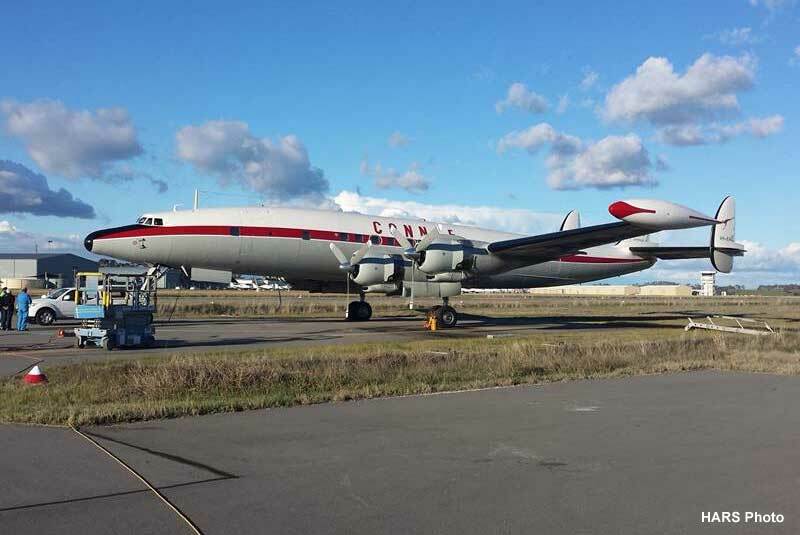 For additional information about this aircraft and the planned move, check out the February 19th and September 30th Constellation News reports. Many thanks to Ray Watts and John Austin-Williams for allowing me to use their photos. 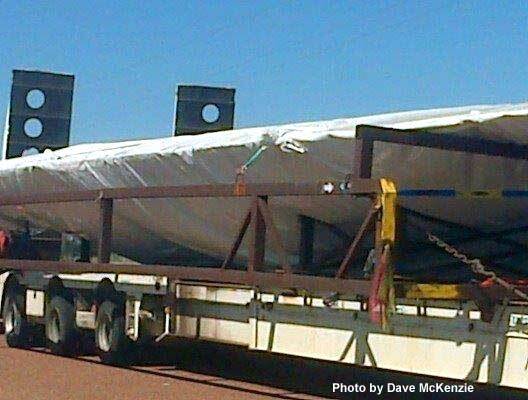 UPDATE...JOHN AUSTIN-WILLIAMS ADVISED ME THAT THE WINGS ARRIVED AT RAND ON THE MORNING OF OCTOBER 25TH. 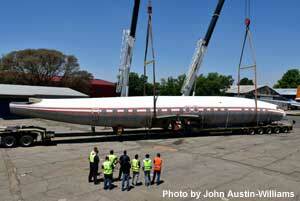 On October 15th I received some additional photos of the move from John Austin-Williams. 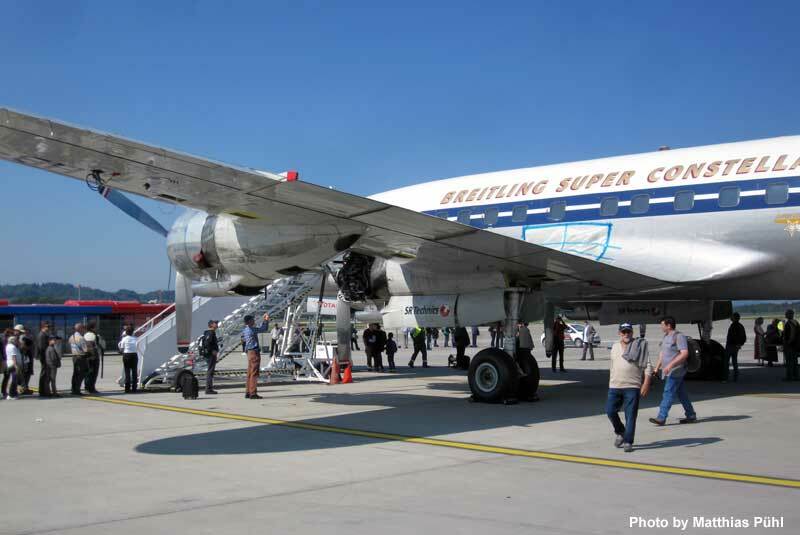 The Super Constellation Flyers Association (SCFA) held a fundraising event on September 23, 2017 at Zürich's Kloten Airport to raise funds for the ongoing restoration of the group’s Super Constellation HB-RSC. 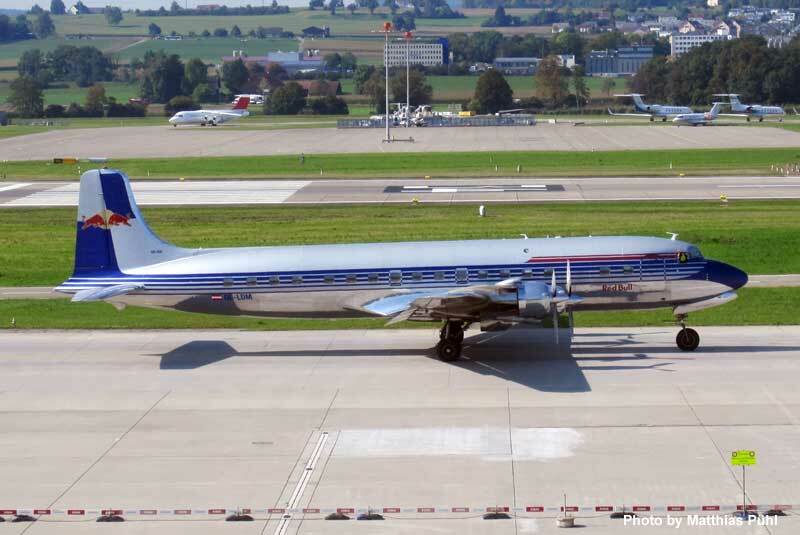 The weather cooperated with clear blue skies and HB-RSC was joined by Red Bull’s DC-6B OE-LDM, which landed at 11:00am. Three sightseeing rides were undertaken by the DC-6B, with proceeds being donated to the restoration fund. 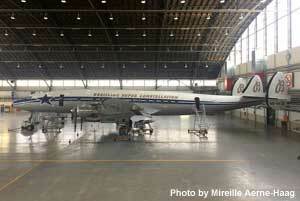 As of September 28th, CHF 1.206M of the CHF 2.0M required to complete the restoration has been raised. For more information on how to donate to this worthy cause, check out the August 11th post on this page. 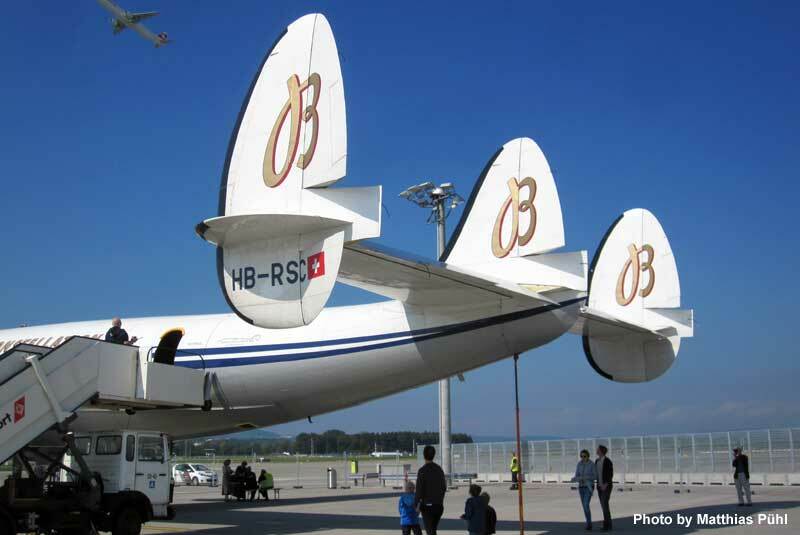 In addition to the fundraising challenge, the organization is losing its main sponsor Breitling at the end of the year and three board members have announced their retirement. One of the board members, Arnold Freund, also served as the group’s Director of Maintenance. 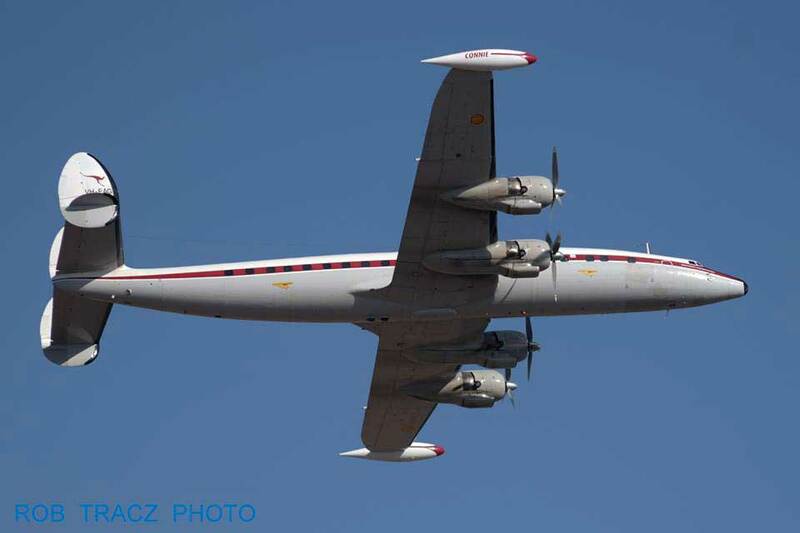 In spite of these challenges, the organization is confident that they will have the Super Constellation ready for the start of the 2018 European Airshow Circuit on May 1, 2018. 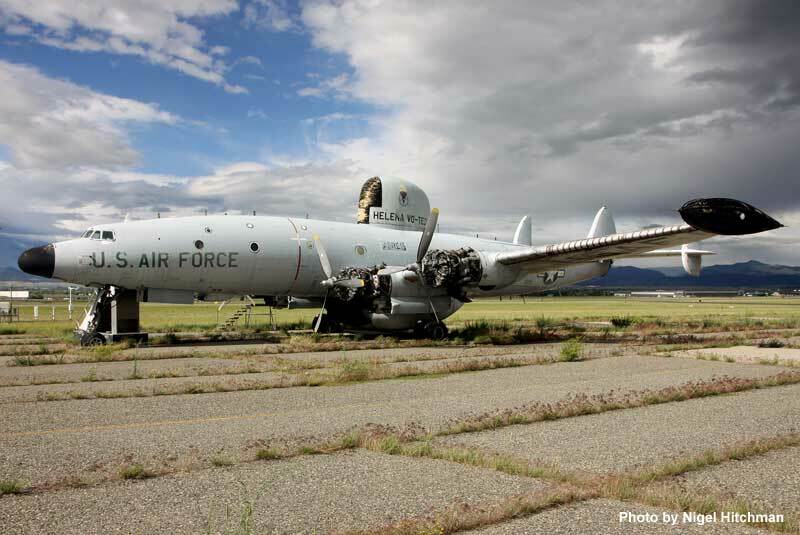 For more information, check out group’s September 11th status report. Many thanks to Matthias Pühl for providing photos of the event. 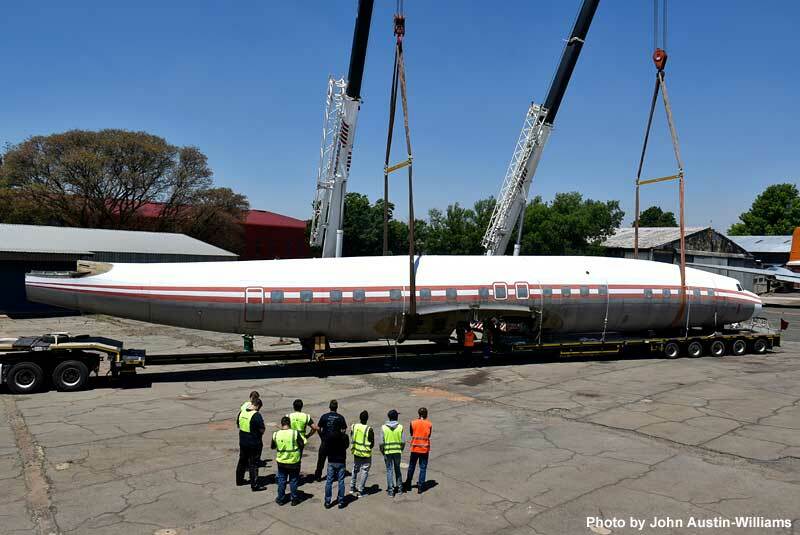 As reported on February 19th, volunteers from the South African Airways Museum Society have been hard at work disassembling and prepping Starliner ZS-DVJ for its move from OR Tambo Airport in Johannesburg to the museum’s headquarters at nearby Rand Airport. 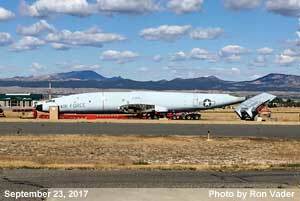 The organization recently released a Plan of Action, which stated that the move will occur on Sunday October 8, 2017. 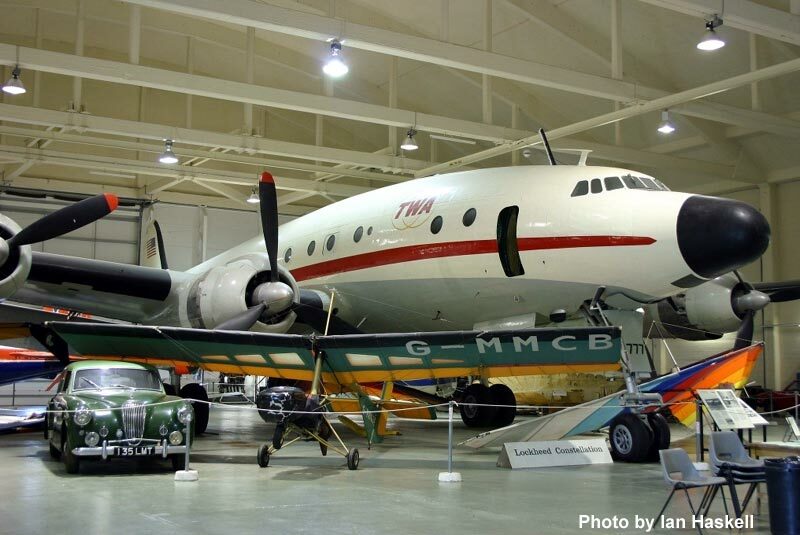 Check out the museum’s website for a fascinating pictorial history of the aircraft since being acquired by the museum in 1978. The upcoming move will the aircraft’s second roadtrip and the link includes a number of photos from its 1979 move from Warmbaths to Johannesburg. As reported on August 2, 2017, the Pima Air & Space Museum had begun a long overdue cosmetic makeover of EC-121T 53-554. 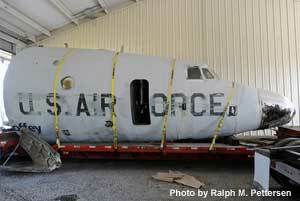 The restoration is nearly complete and the museum recently posted a photo of the aircraft on Facebook. She's looking very nice indeed. 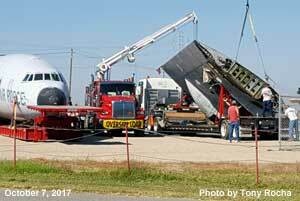 It appears that Starliner N7316C made it through the August 14th fire suppression foam incident surprisingly well. 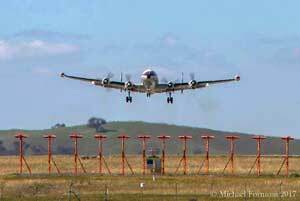 I base this on my conversations with an independent a very knowledgeable source who had an opportunity to inspect the aircraft and from the September 2017 project update posted on the Lufthansa Super Star website . Here's the September status update. The first half of 2017 was filled with an array of special highlights. 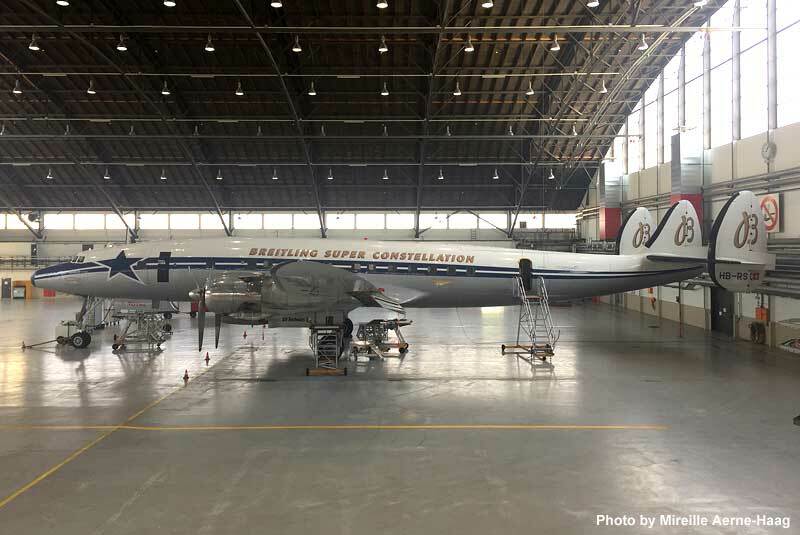 Since the completion of the primary structure overhaul of the fuselage, wings and empennage, the Super Star technical teams in Auburn and Hamburg switched their main focus to the overhaul and installation of secondary structural parts. 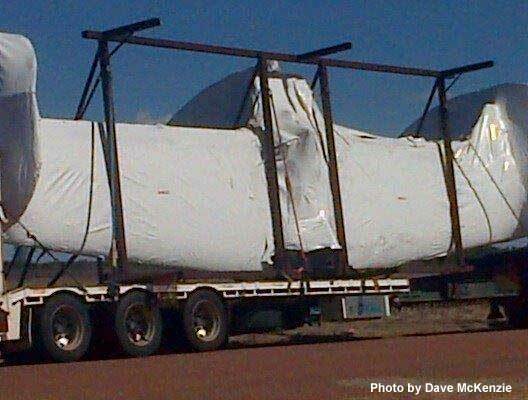 In the meantime all four overhauled engine nacelles have been re-attached to the Super Star wings. 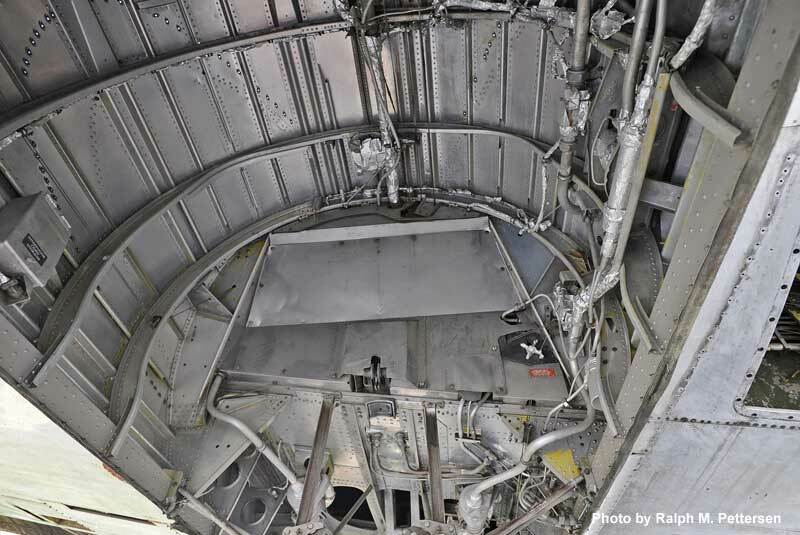 While only the inner nacelles serve as main landing gear wells, both the outer and inner nacelles are packed full of aircraft system components. 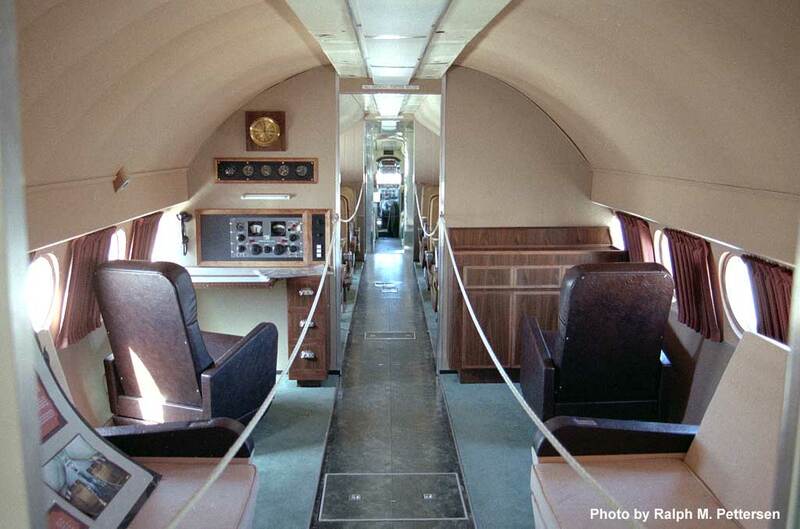 The cabin supercharger compressors are connected to the outer engines, which are needed to keep up the cabin pressure while flying at high altitudes. 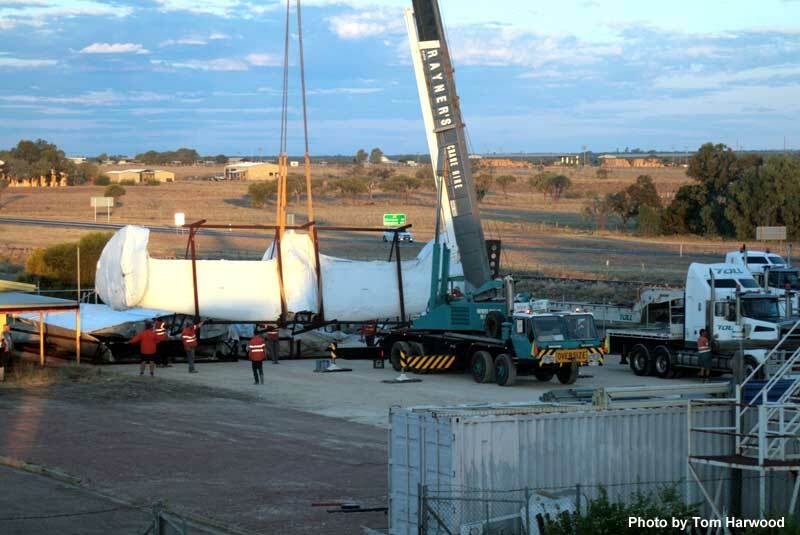 During the first six months of this year, the wings have begun to regain their original shape as the leading and trailing edges plus wing tips are in the process of being reinstalled. 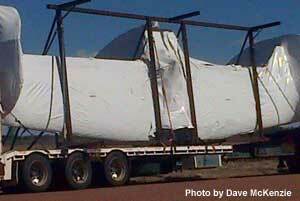 Additionally the aerodynamic, wing to body fairings were attached. 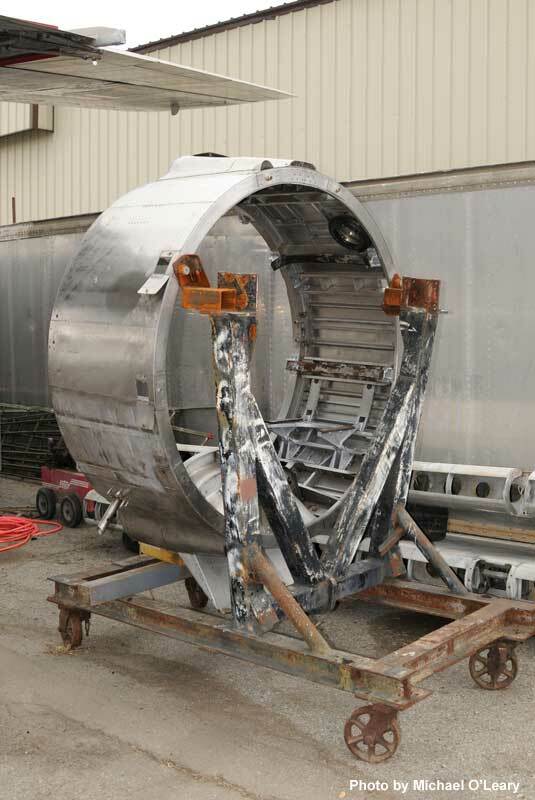 The overhauled main landing gears will be installed in the wheel wells after the inner nacelles have been fitted with cables and hoses, connecting the engines in front of the nacelles. Only then will the Super Star again stand on her own three gears. 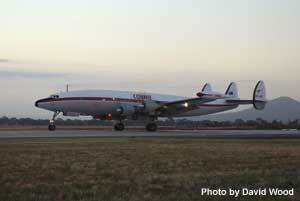 The Super Star team expects this very special milestone of the L-1649A project to happen in 2018. In parallel to this the wooden racks, which have, for many years, held the aircraft in a stress free position to enable overhaul work, will be dismantled. Amongst other things, this stress free mounting is a prerequisite for the current installation of flap rails in the exact angle. 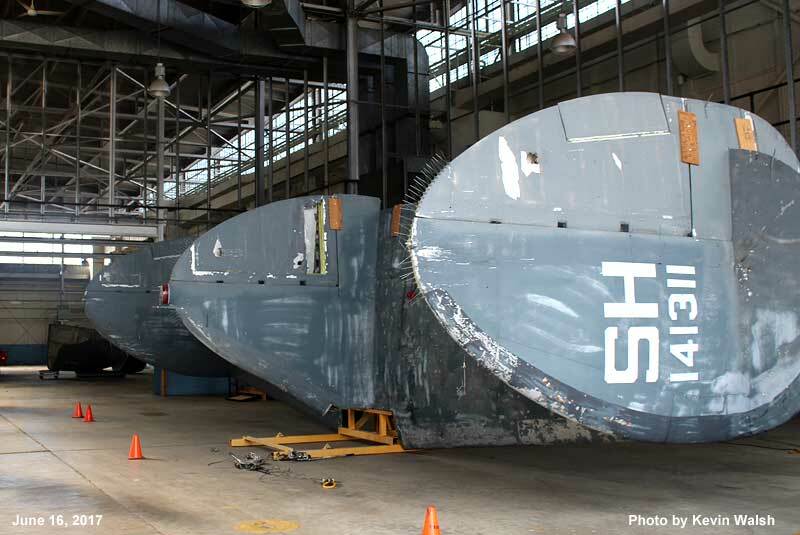 Back in 2016 the horizontal and vertical rudder overhaul was completed. 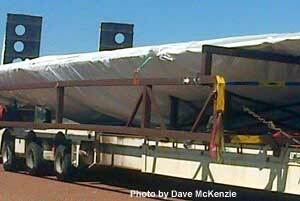 When covered with a special fabric by a specialist company, the rudders will return successively to their original position at the aircraft empennage. In a short while the characteristic look of the Super Star with its three fins will be reinstated. The Super Star technical team is not only working at high pressure on the prerequisites for the installation of the new glass cockpit but in parallel they devote a lot of time and effort on the test and overhaul of complex flight control components. Furthermore the first overhauled components are being installed in the forward underfloor hydraulic bay of the Super Star fuselage. 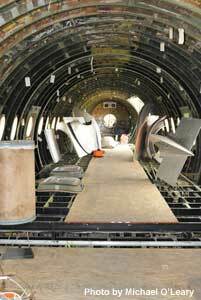 One floor up, the team outfits the future passenger cabin with floor panels and seat tracks. They are a prerequisite for the installation of the already completed passenger seats. 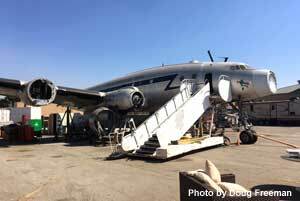 Doug Freeman visited Planes of Fame in Chino, California on September 27, 2017 and forwarded a status report and photos on the restoration of VC-121A 48-613 Bataan. 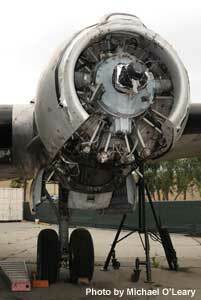 I was able to get to Chino today for a really great tour of Bataan from Pete Blood. 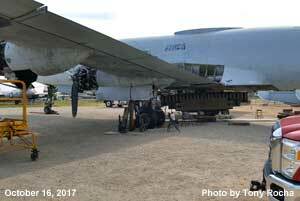 They are making slow but steady progress on the project, though much of it is still in the “take apart” phase. 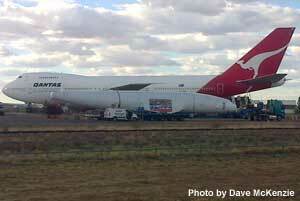 As you can see from the photos, the tail is off and it is in rework off line. 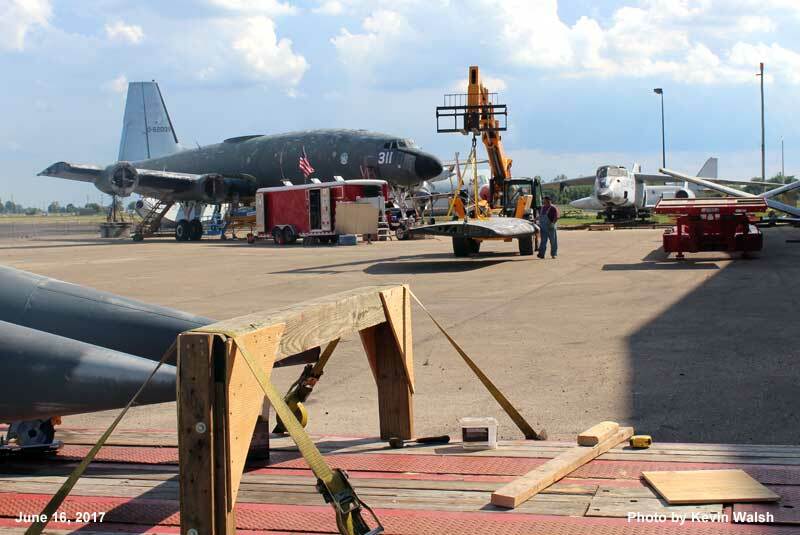 All the actuators, harnesses and such have been reworked and reinstalled pending the return of the horizontal stabilizer. Rudders will stay off for now to protect the fabric. 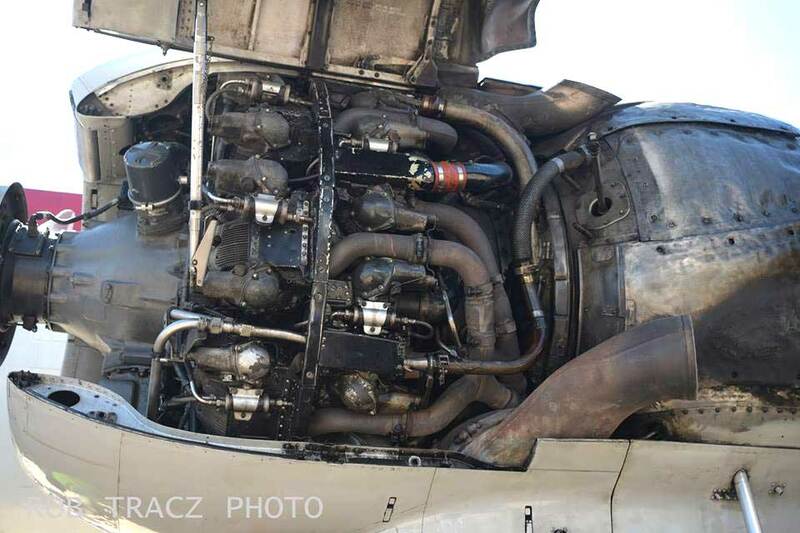 Five engines are being reworked and will come back installed on QECs. There is still a lot to do with the engine mounts. 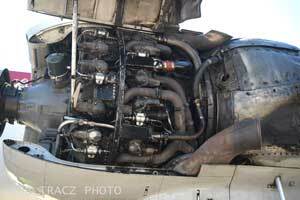 The cabin superchargers that were on the #1 & #4 engines along with associated wiring and tubing are gone as there is no plan on flying the airplane at high altitude. 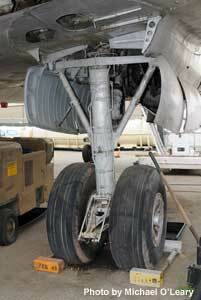 Lot of weight savings! 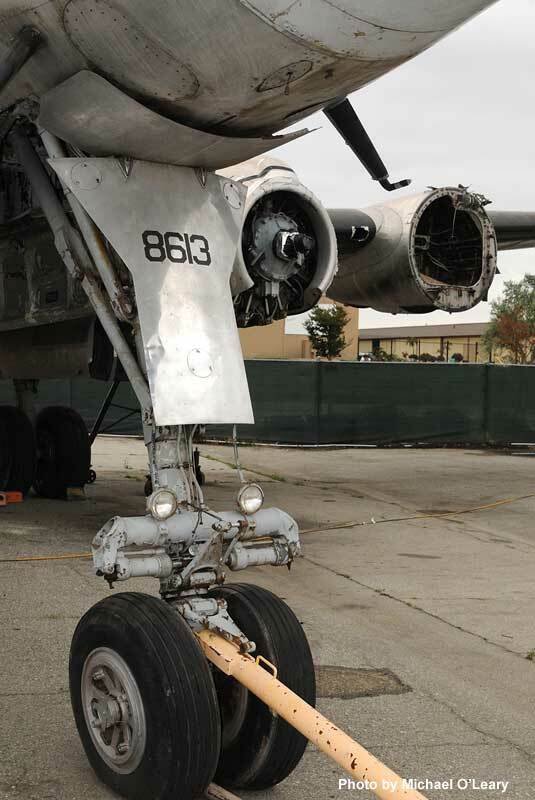 Pete found a new nose wheel, but the mains will have to be removed for rebuild, one at a time. As you can see, the interior is completely gutted making for easy access to underfloor wiring and hydraulics. Pete says the interior structure is in good shape. 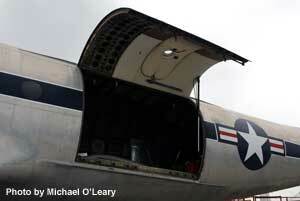 They were removing the outer wing panels during my visit. 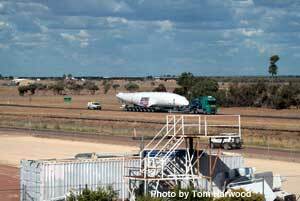 Timeline for project completion is still estimated to be 18-24 months. 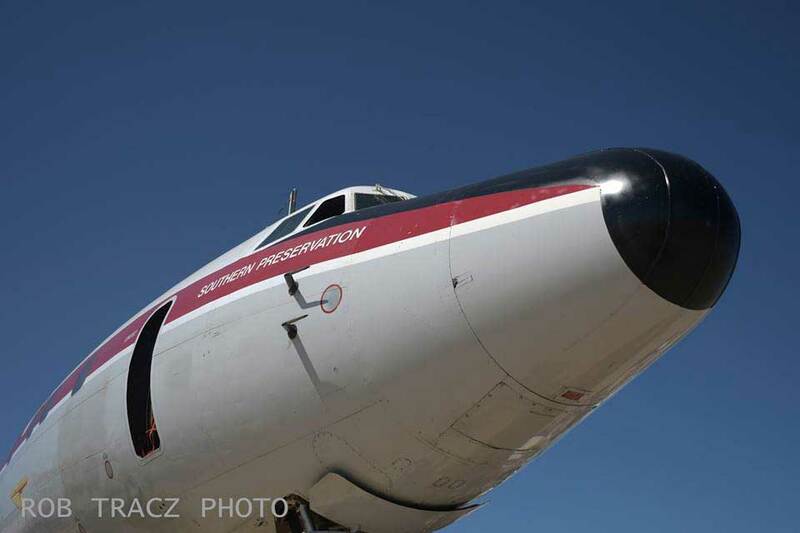 One other side note: They have a North American Navion essentially identical to the one MacArthur had assigned to him in Korea and plan to pair it up with the Connie for show purposes. 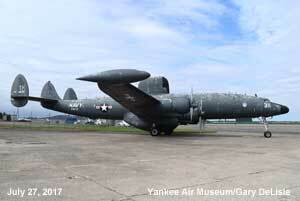 Many thanks to Doug for his report and photos. 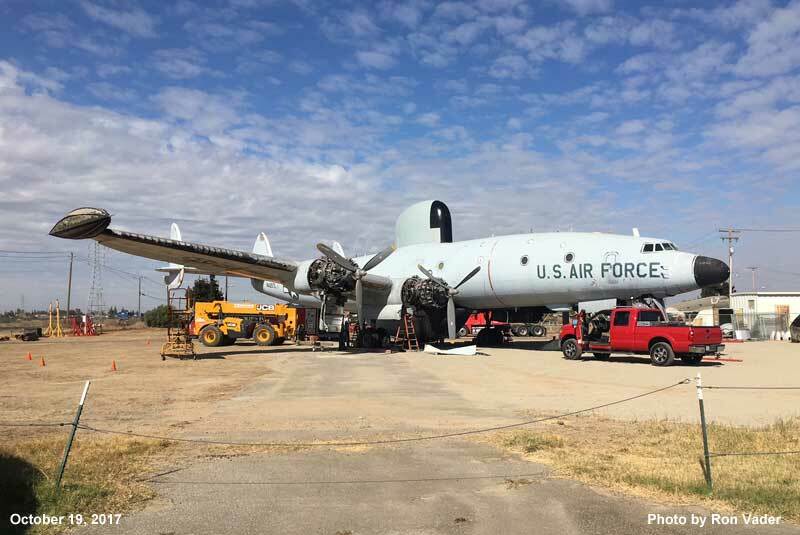 As reported on August 26th, a crew from Worldwide Aircraft Recovery arrived in late August to begin disassembling EC-121T 52-3417/N4257L for its move to Castle Air Museum in Atwater, California. On September 20th disassembly was just about complete and the fuselage was loaded onto a lo-boy trailer. 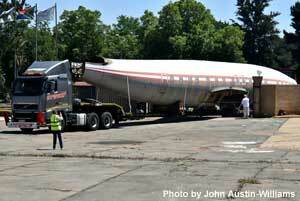 Once the top radome is removed, the fuselage will be ready to head south to California. 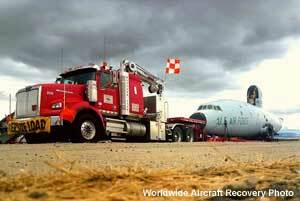 It's great that one more Connie has been saved! 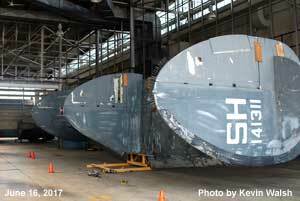 The HARS Facebook page includes a number of photos taken by Michael Formosa and a YouTube video documenting the flight. I’ve included a trio of Michael’s photos. 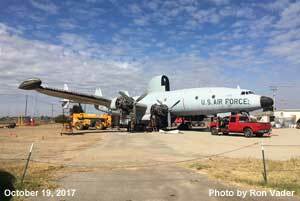 The folks from Worldwide Aircraft Recovery arrived in Helena, Montana on August 22, 2017 to begin the task of disassembling EC-121T 52-3417/N4257L in preparation for the long roadtrip to Castle Air Museum in Atwater, California. 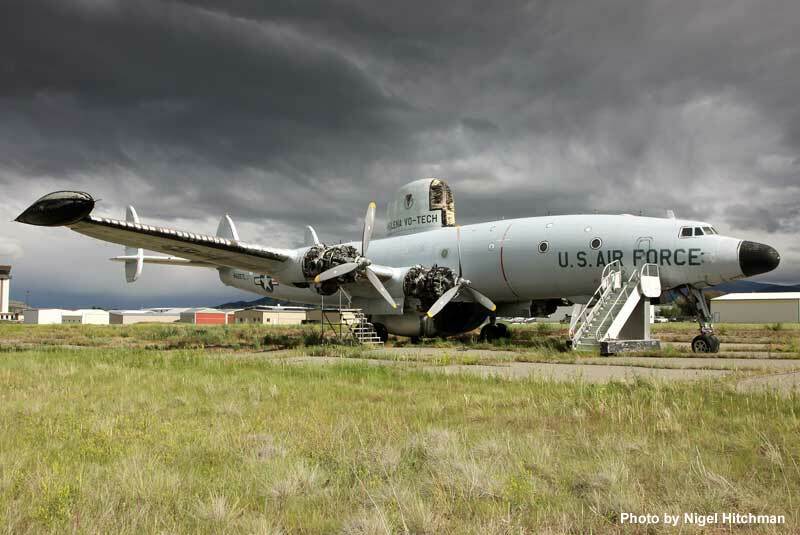 The aircraft has been a fixture at Helena Regional Airport since July 1981 when it arrived for use as a technical trainer at the Helena College of Technology. The school declared it excess in November 2008 and it was acquired by the Evergreen Air & Space Museum in May 2009. The museum’s original plan was to make it airworthy for a ferry flight to McMinnville, Oregon but this never happened and it was acquired by Castle Air Museum in January 2014. Tony Rocha is heading the museum's restoration project and, while the aircraft was inspected and found to be in relatively good condition, the decision was made to disassemble and move the aircraft to California by road. 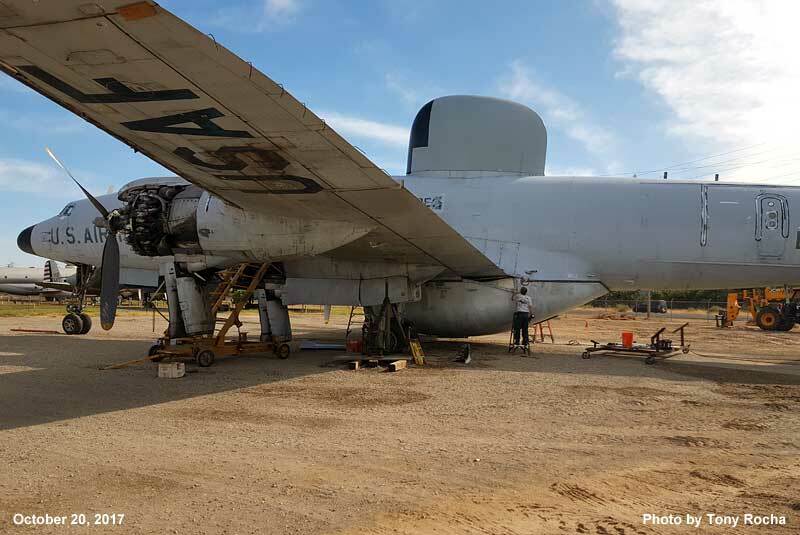 One only has to look at all the hoops that the FAA made Yanks Air Museum jump through when they ferried EC-121T 53-548/N548GF from Camarillo to Chino back in 2012 to realize this was the correct decision. 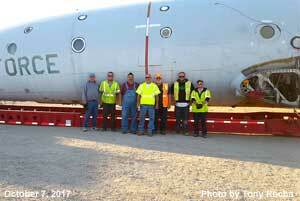 Once the aircraft arrives in California, it will be reassembled by the Worldwide crew. 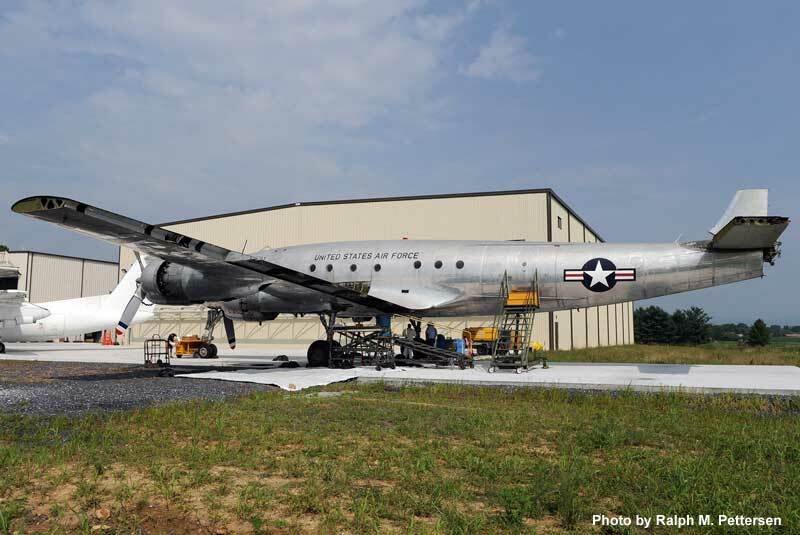 Worldwide recently completed the disassembly, move and reassembly of EC-121K BuNo 141311 from the defunct Octave Chanute Aerospace Museum to its new home at the Yankee Air Museum in Ypsilanti, Michigan so they ought to be well versed in the drill. 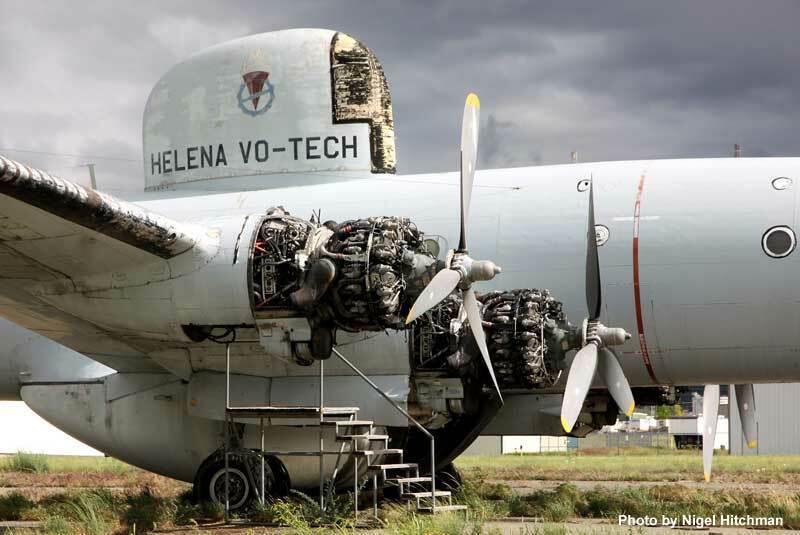 Nigel Hitchman recently completed an epic roadtrip, which included visits to museums, boneyards and airports in South Dakota, Wyoming, Montana, Idaho, Utah and Colorado and sent me some very nice photos of the Helena EC-121T. The lighting conditions were near perfect and Nigel made the most of the excellent conditions. 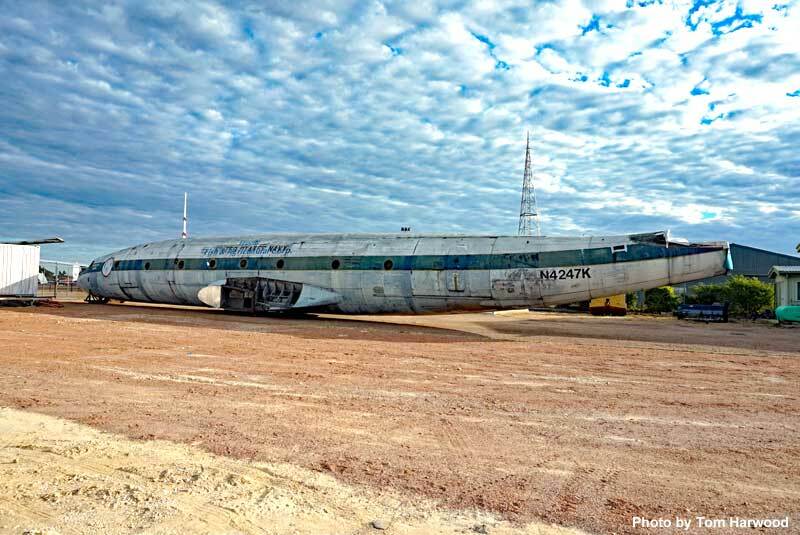 The results are some gorgeous shots of a rather weary looking airplane. W.E. Payne forwarded links to reports from Portland television stations WCSH and WGME along with a report from the Firehouse.com website. The new flap link rods have been completed and should be installed in August. Fire damage to the landing gear will not be repaired until late August/early September. Certification of the new wheel rims should be completed in August. 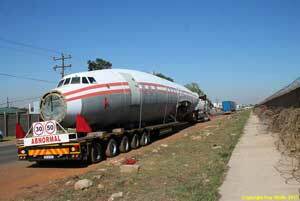 The corrosion inspection has been completed. 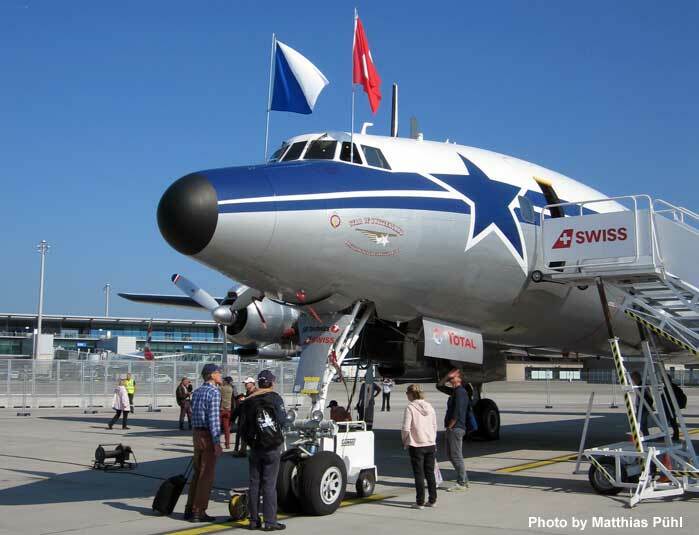 An event is scheduled at Zürich's Kloten Airport on September 23, 2017 (rain date September 30). 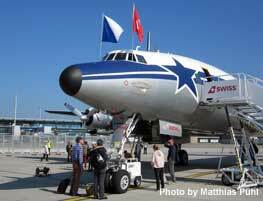 A bus trip to the German city of Dresden is planned for October 20-22. "Smoke and steam to help save the Connie" is planned for October 29. 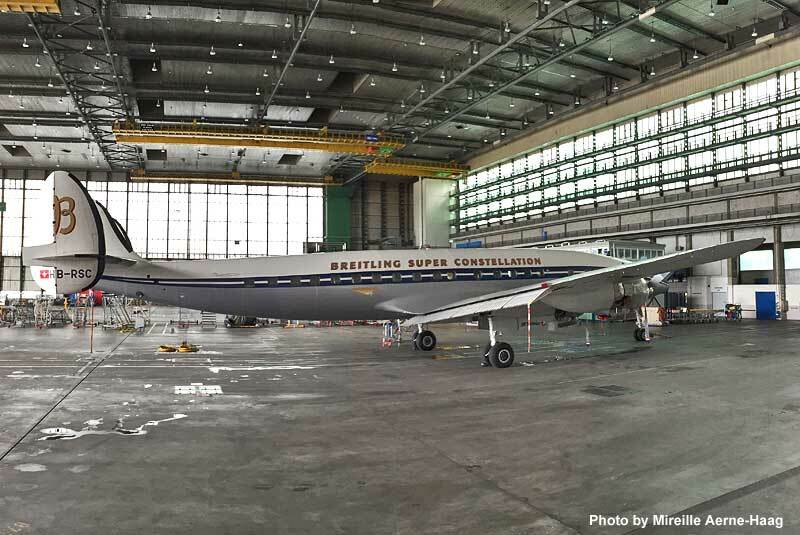 Mireille Aerne-Haag was kind enough to send me some recent photos of HB-RSC in the organization's Zurich maintenance hangar. 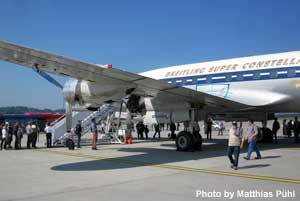 SCFA has set up a Facebook group "Save our Connie, the Breitling Super Constellation." If you'd like to contribute to this worthy cause, you can make your contribution in Swiss Francs (CHF), Euros or U.S. Dollars. In addition, a short video appealing for contributions has been posted on YouTube. 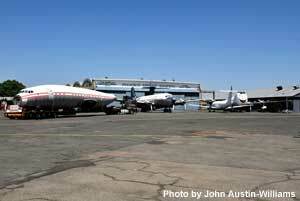 For additional information and updates, check out the SCFA website at http://www.superconstellation.org/index.php/en/. 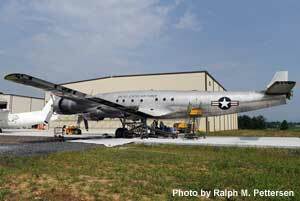 As reported on this website on February 17, 2017, the Yankee Air Museum acquired EC-121K BuNo 141311, which had been on display for many years at the now defunct Octave Chanute Aerospace Museum in Rantoul, Illinois. 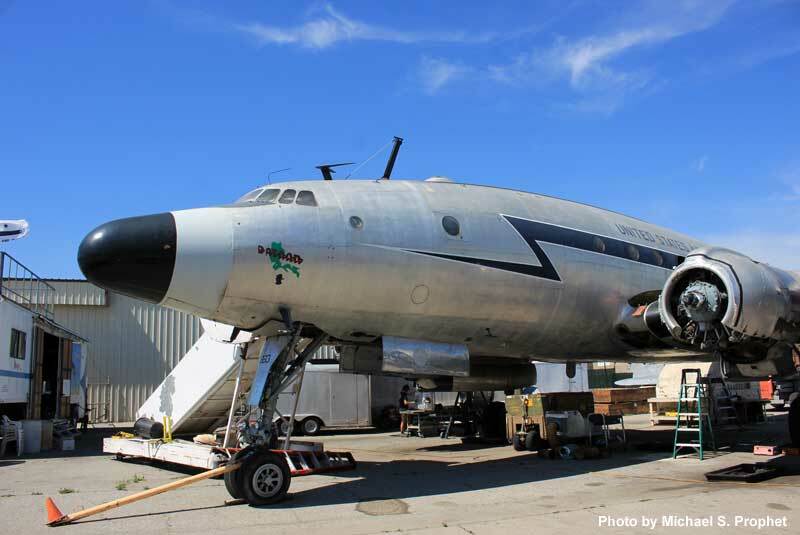 The aircraft was one of a number of large aircraft in the museum's collection that were in danger of being scrapped when the Ypsilanti, Michigan based museum stepped up and agreed to add the aircraft to its collection, thus saving it from the scrapman. (Unfortunately, the former museum’s C-97 and C-133 will most likely be cut up.) 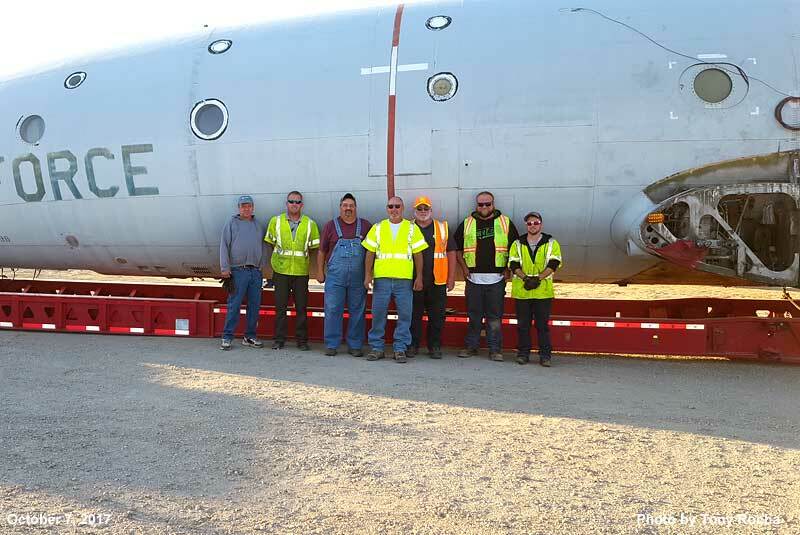 The folks from Worldwide Aircraft Recovery arrived in Rantoul in early June and by mid-July the EC-121K had been disassembled and was transported by road to Ypsilanti. 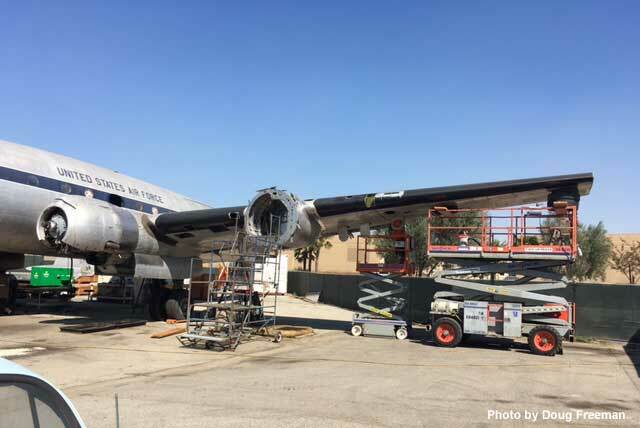 While it took over a month to disassemble her, it took the Worldwide crew less than two weeks to reassemble the old girl and she is now ready for the restoration crew at the Yankee Air Museum. Kudos to all involved in the rescue of this historic aircraft and thanks to Kevin Walsh, Nate Gallagher and the Yankee Air Museum for providing photos. 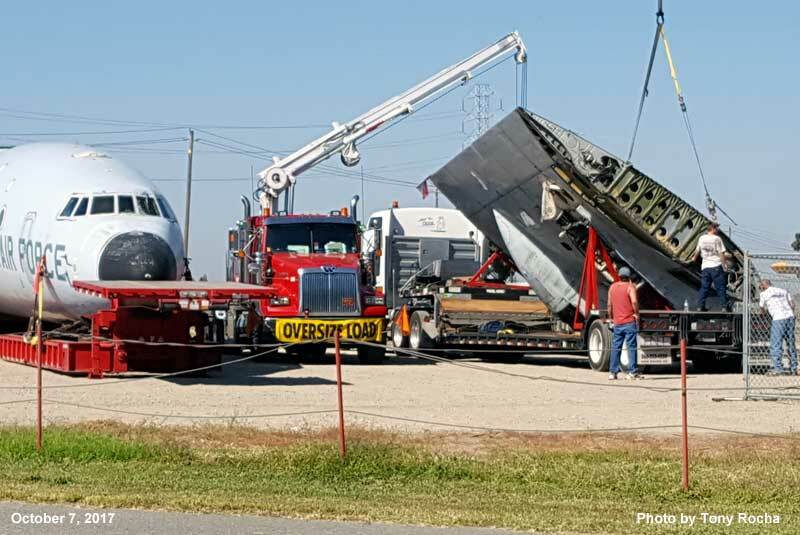 Disassembling and moving large aircraft is very expensive and the museum recently added a page to their website soliciting donations for this very worthwhile project. 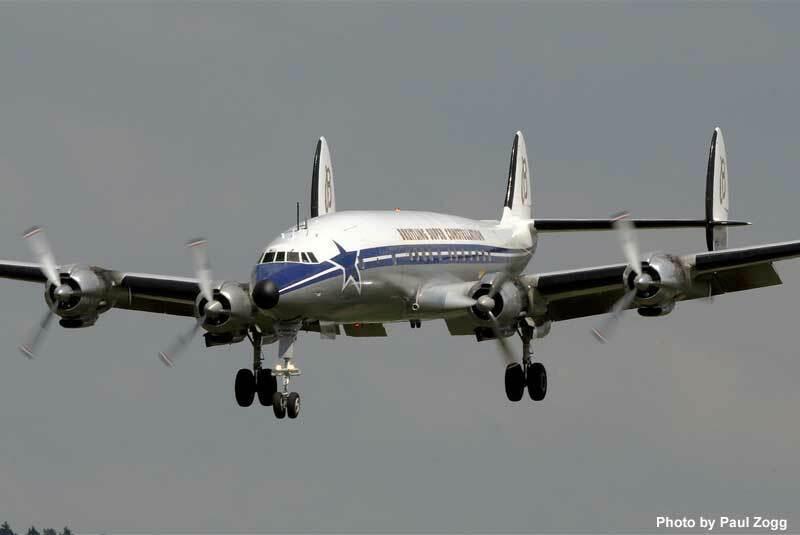 Lufthansa Flyer TV published a very interesting video in March 2017 about the overhaul of the engines, propellers and spinners for L1649A N7316C. 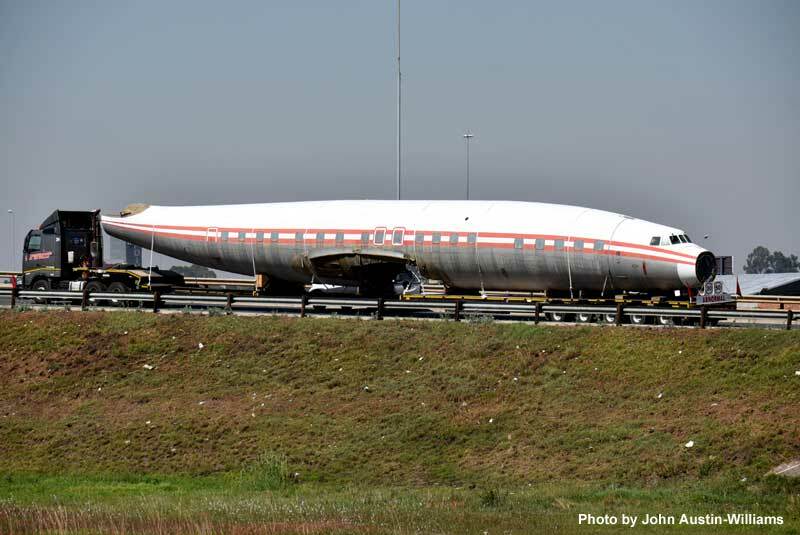 While there have been off and on rumors over the years about the viability of this massive restoration project, I think it’s safe to assume that Lufthansa is totally committed to seeing this project through completion! Stephen Carvenor posted a photo on Facebook in late June 2017 showing EC-121T 53-554 parked on the restoration ramp at the Pima Air & Space Museum. 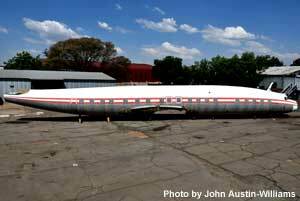 According to my sources, the aircraft is scheduled to receive some long overdue cosmetic attention, including a repaint. She was looking a bit rough around the edges even 10 years ago when I photographed her at the museum. The harsh Arizona sun plays hell with paint and its good to see that the museum is giving the old girl a bit of TLC. 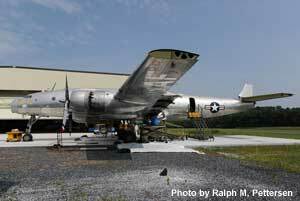 I visited Dynamic Aviation in Bridgewater, Virginia on July 21, 2017 to check out progress on the restoration of VC-121A 48-610 Columbine II. 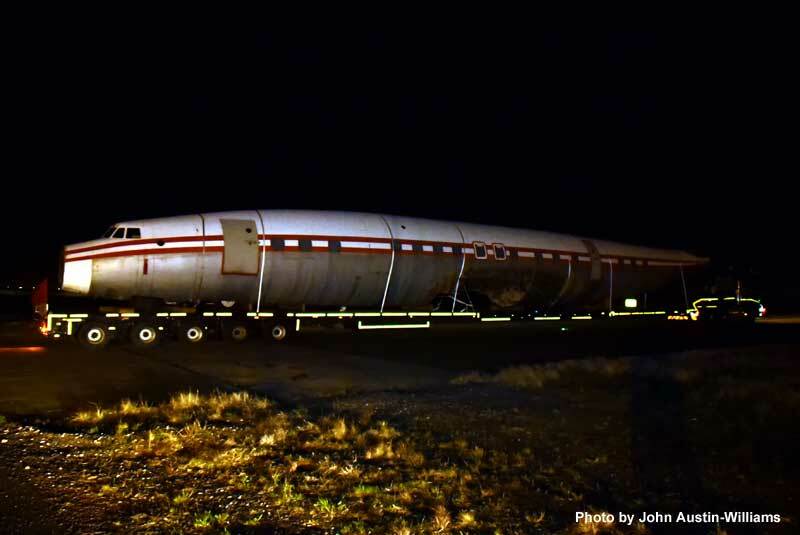 Karl Stoltzfus, the founder of Dynamic Aviation, rescued the Connie from the Arizona desert in 2015 and made her airworthy for a flight back to Bridgewater in March 2016. 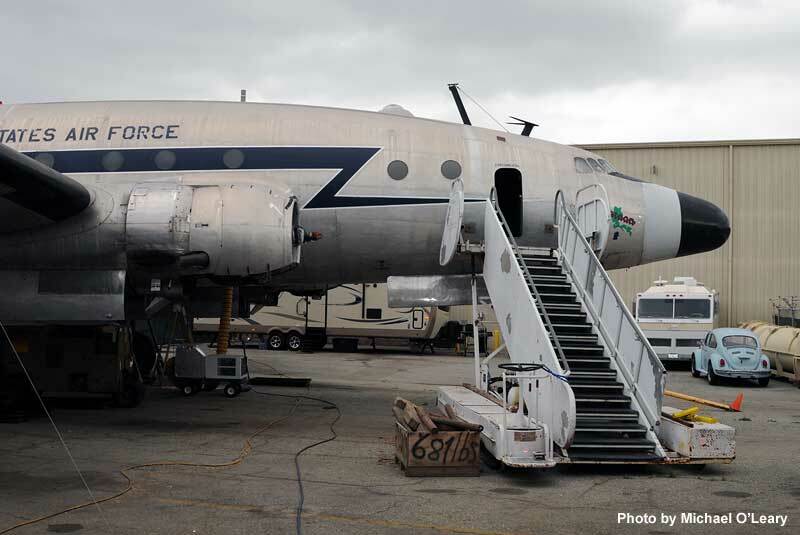 Karl plans on restoring her back to her Air Force One glory days and the project is progressing nicely with workers removing systems that are no longer required. These include the pressurization system, auto-pilot, radar, de-icing boots and many miles of redundant wiring. The day of my visit, workers were cleaning almost 70 years of accumulated dirt, grime, paint and grease from the main wheel wells using a dry ice blasting system. The system removes dirt and paint without leaving any grit. I had a look at a finished wheel well and the final result was very impressive. Work on the interior has started but is in the very initial stages. 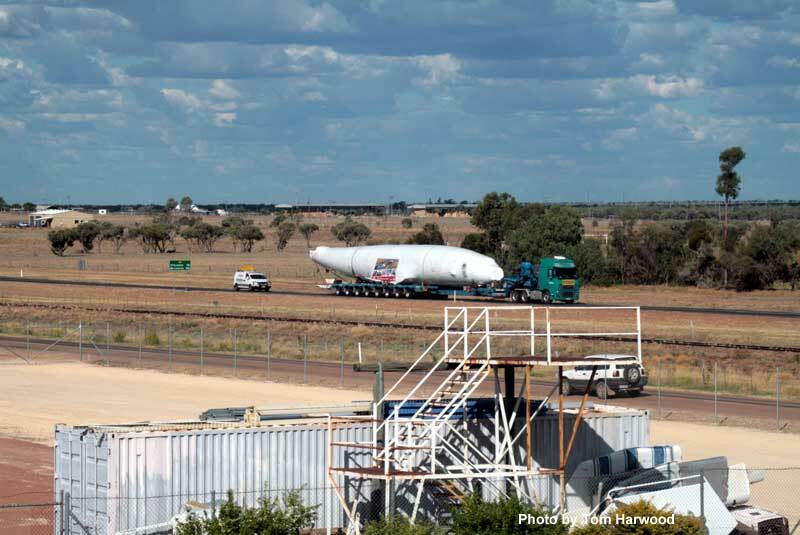 Karl said he had acquired another Constellation forward fuselage and, sure enough, he showed me the forward fuselage of USAF EC-121H 53-535, which he bought from the Australian group HARS in early February 2017. 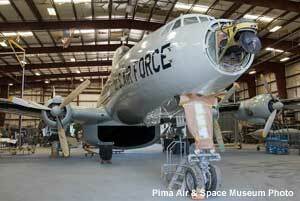 After being retired in 1969, the aircraft was put on display at the Pima Air and Space Museum from 1973 to 1981. 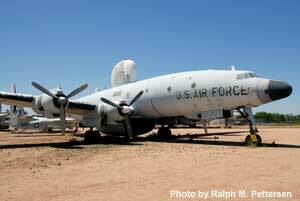 Upon its return to Davis Monthan AFB, the aircraft was put on display at the front gate before finally being sold at auction. Stored for 20+ years at a nearby scrapyard, it was sold to HARS in 2007. 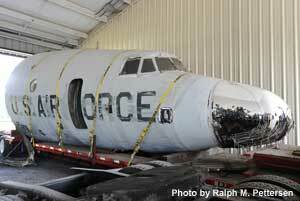 It was towed the short distance to the Pima Air Museum in 2008 and scrapped in August 2011, with the forward fuselage being set aside in the museum’s restoration area. 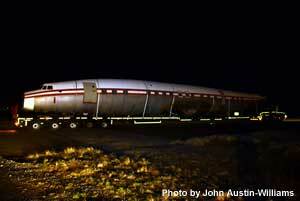 The fuselage was transported to Bridgewater in April 2017. 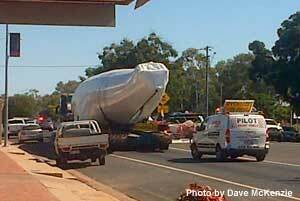 I was surprised when I saw the fuselage but glad that Karl had saved it. 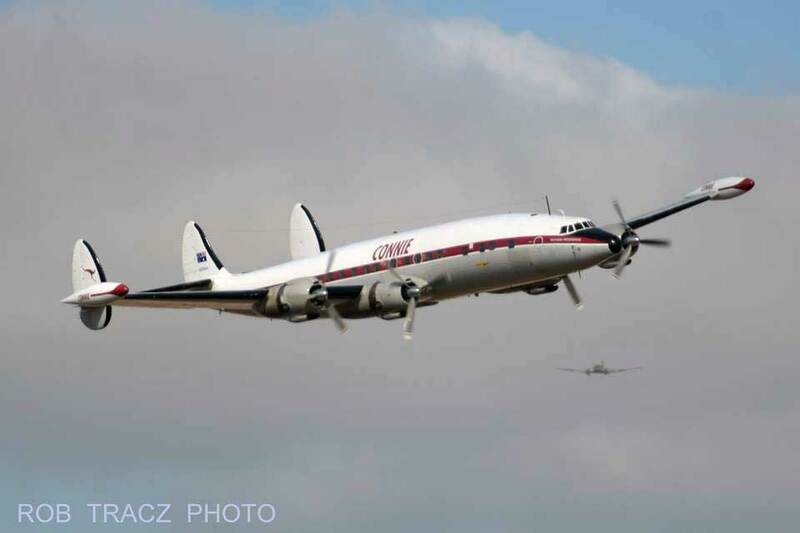 On June 1, 2017 Super Constellatino Flyers Association (SCFA) President Markus Weishaupt and Maintenance Director Arnold Freund issued a statement on the SCFA website announcing that the decision had been made to ground the organization's Super Constellation HB-RSC for the 2017 airshow season due to maintenance issues. 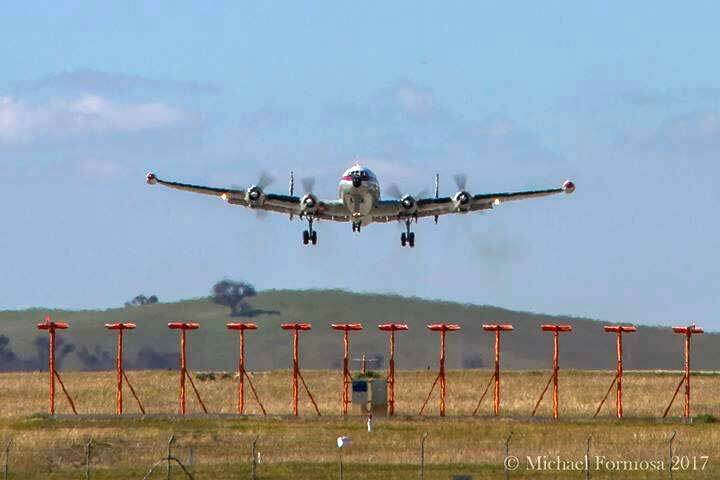 "The development and manufacturing of the 24 wing flap rods have proven to be a lot more challenging than originally anticipated. 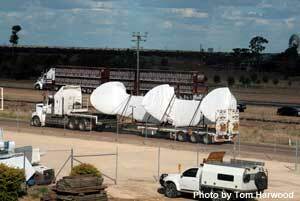 It remains unclear how long it will take to complete the production of the parts. 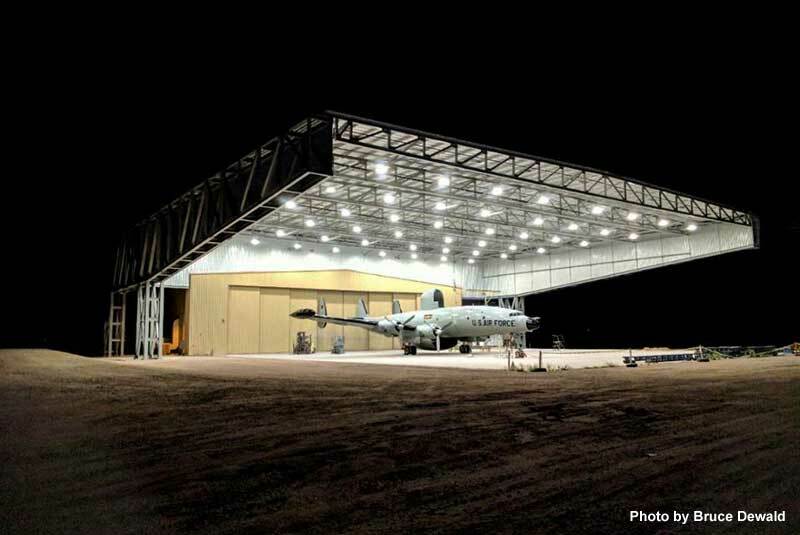 Additionally, they will have to undergo a FOCA certification process prior to being installed in the aircraft." 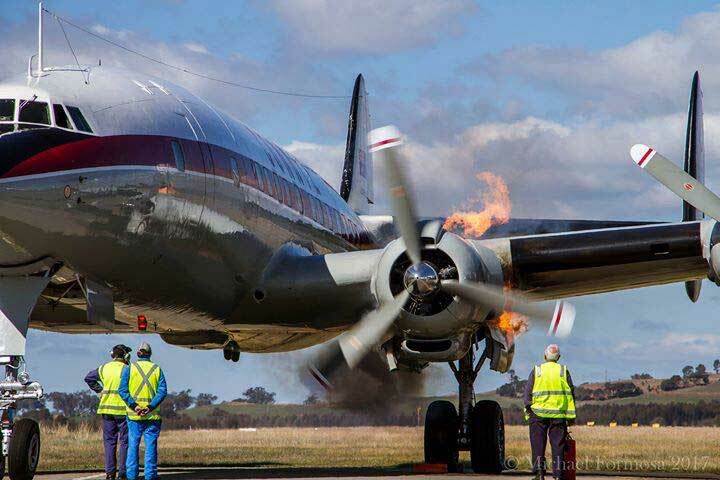 "The wheels which were newly produced over the winter months were subject to functionality and vibration tests during which the brakes overheated, and the landing gear caught on fire. 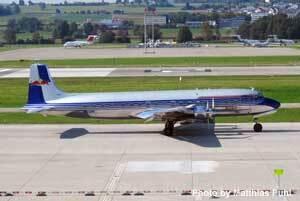 In spite of the Zurich airport fire brigades' quick response, damage occurred to the aircraft. 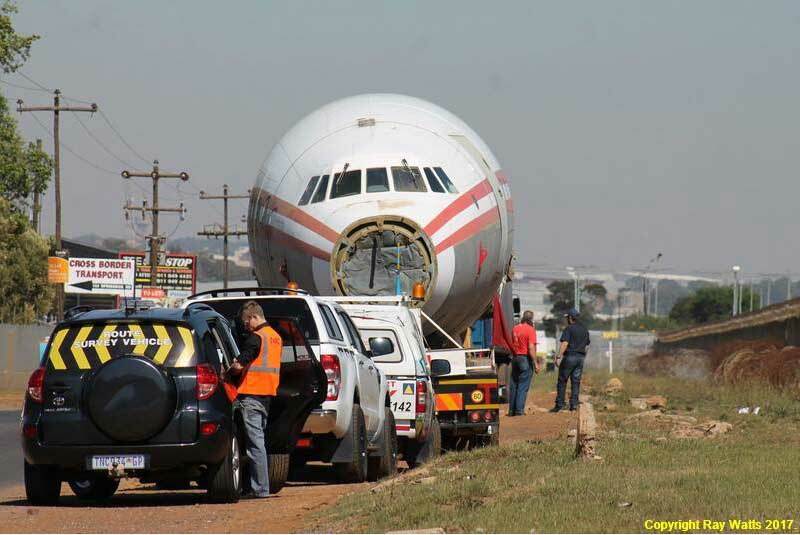 All wheels, tires, and brakes will need to be replaced. Various landing gear components, such as hydraulic and electric motors need to be inspected thoroughly, and repairs and replacements will need to be made as necessary. 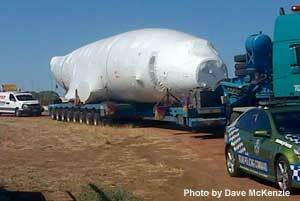 Completing these inspections and repairs could take up to two months". 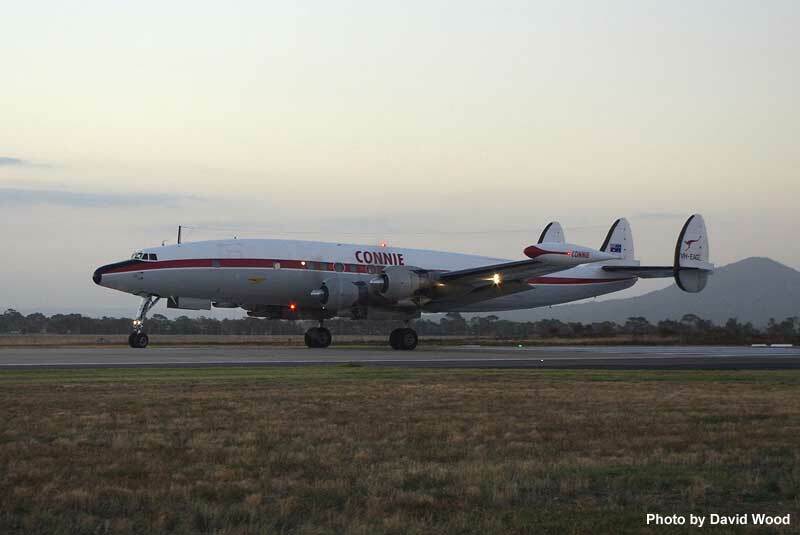 The statement goes on to say that without an additional $1.5M to $2.0M Swiss francs, the project will be unable to continue and they are launching an emergency appeal called ”Connie Fly” to raise the necessary funds. For additional information, check out the complete statement on the SCFA website. 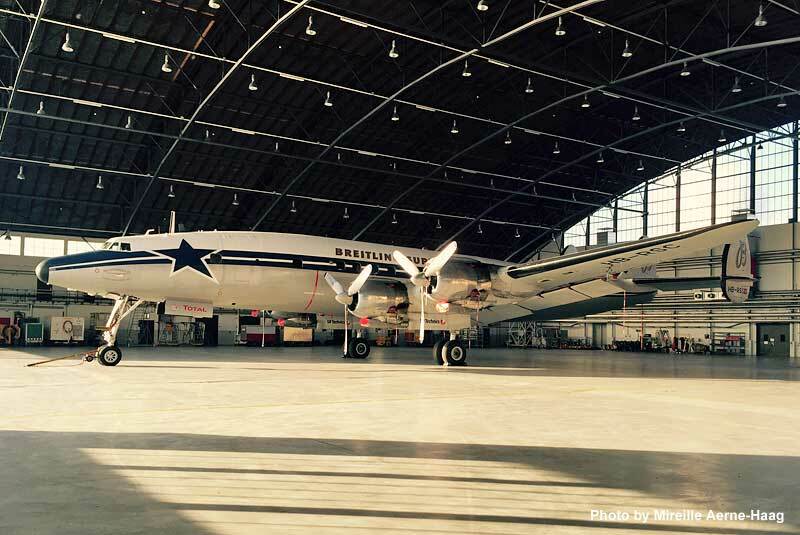 I wish them luck in raising the necessary funds to keep this gorgeous airplane where she belongs…in the air flying! 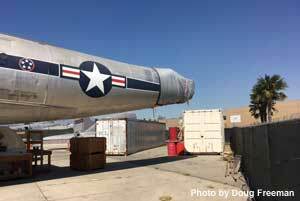 Restoration of VC-121A 48-613 Bataan is progressing nicely at The Planes of Fame Air Museum in Chino, California. 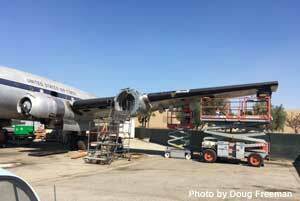 The empennage was removed and work on the horizontal and vertical stabilizers is well underway. Overhaul of the first R3350 engine has been completed at Mike Nixon's shop and has been test run. When the interior lining was removed, workers found that complete scoreboards from the 1948 World Series had been penciled on the interior sheet metal walls. 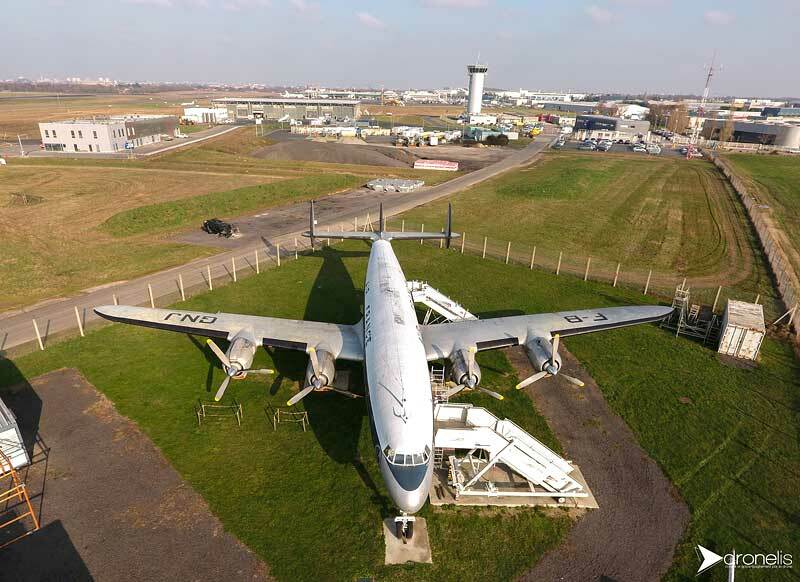 Hopefully this little bit of history will not be destroyed and be left for the workers to find in 50 years when the aircraft is restored once again! 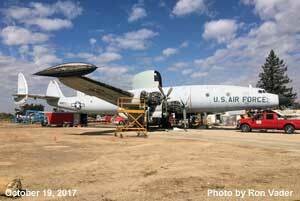 Michael O'Leary POF on May 16, 2017 and forwarded some detailed photos of the aircraft. 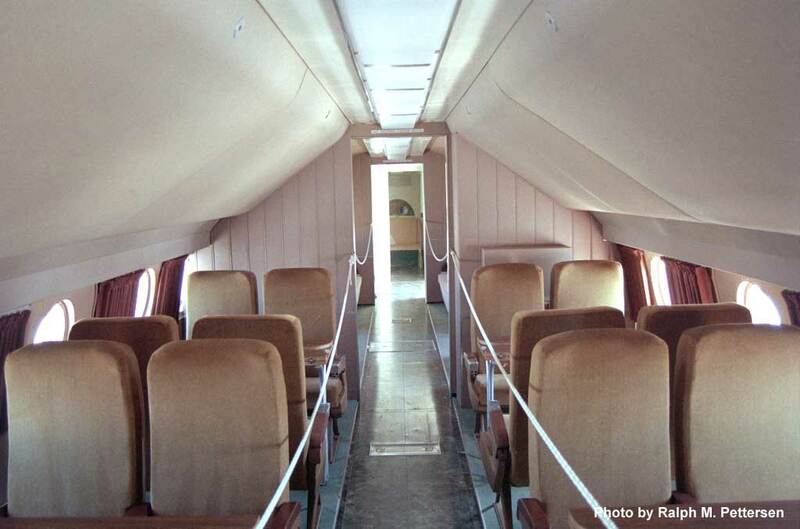 It's interesting to note that the entire interior of the aircraft has been removed. I don't quite understand this since an interior was installed during the last restoration in 1994 that supposedly duplicated the interior that was in place when the aircraft served General MacArthur. 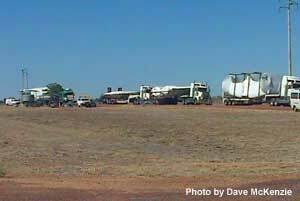 Check out these two photos taken in February 1999 and let me know what you think. Photo #1 and Photo #2. 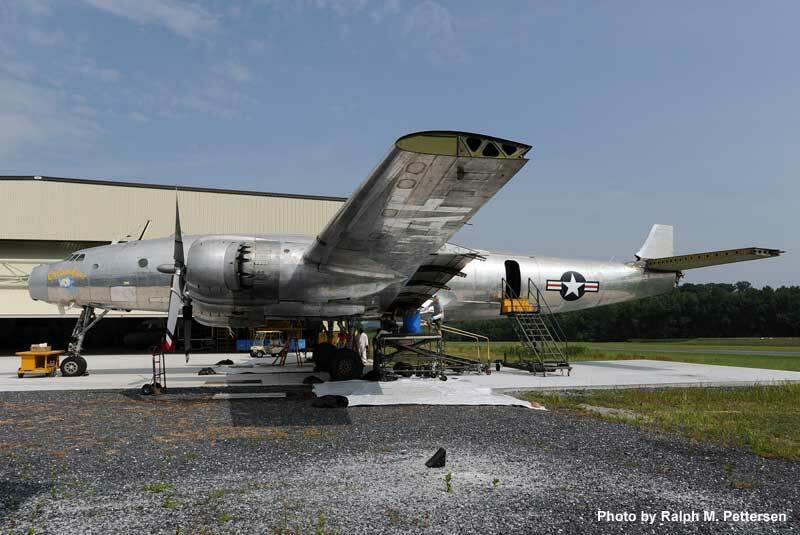 Michael S. Prophet visited the museum a week later on May 23, 2017, when the weather was decidedly nicer. He was kind enough to forward some additonal photos of the aircraft. 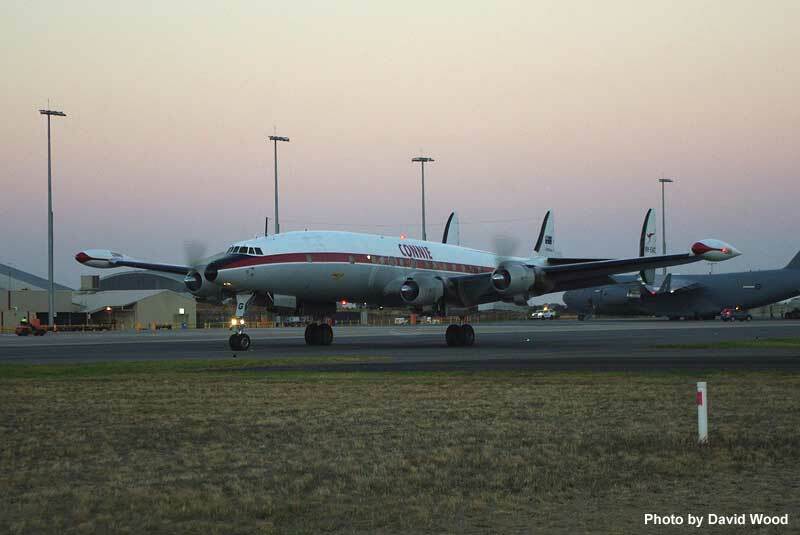 HARS Super Connie VH-EAG emerged from the Douglas Aerospace paint shop in Wagga-Wagga after a two month makeover. She looked great and "Delta Charlie” posted the following report and photos on Facebook. 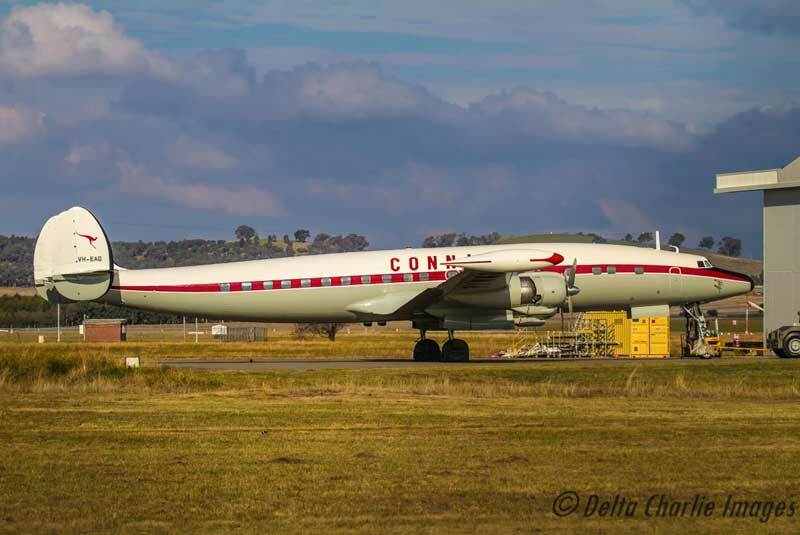 "So on my way home from Wagga Wagga today I swung by Wagga Airport (YSWG) and saw a familiar ol girl parked up... Good ol Connie, VH-EAG a Lockheed C-121C Constellation sporting a new coat of paint and looking a million $$ without any exhaust stains on her engines yet... (personally I think the exhaust stains give her character) Not sure when she is due home back at HARS in Albion Park... but probably won’t get as close to her again for some time." 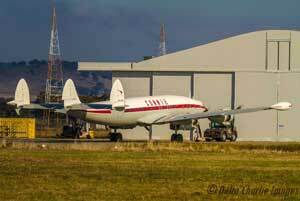 Super Connie N4247K arrived at the Qantas Founders Museum in Longreach, Australia on May 24, 2017 after a long sea and land journey from the Philippines. 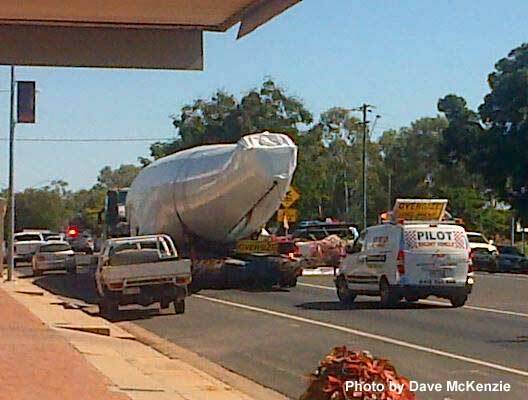 Dave McKenzie photographed her enroute and arriving at the museum. 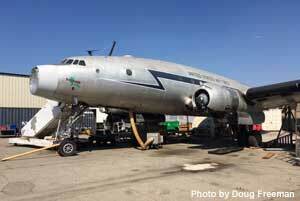 Tom Held recently sent me a link to Lufthansa’s updated Super Star restoration project website. 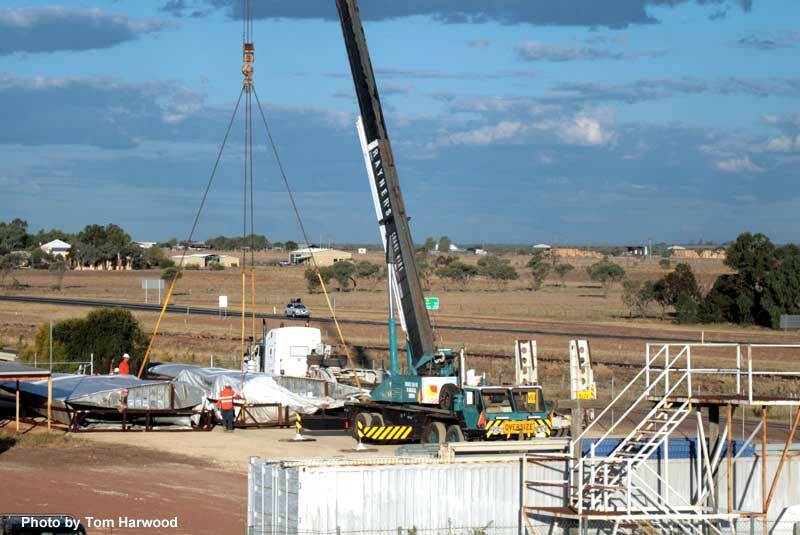 The website includes a page detailing plans for 2017 and a summary of project events going back to the project’s 2008 inception. 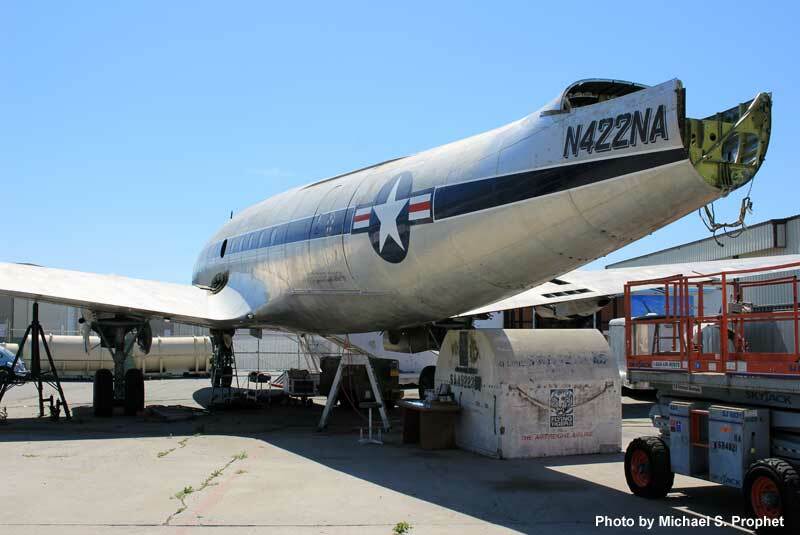 Included is lots of information and photos about the project and it appears that there’s finally light at the end of the tunnel on the restoration of N7316C. 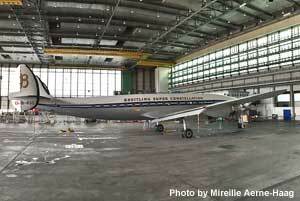 Kudos to the folks at Lufthansa and Lufthansa Technik for their perseverance on seeing this project thru completion! 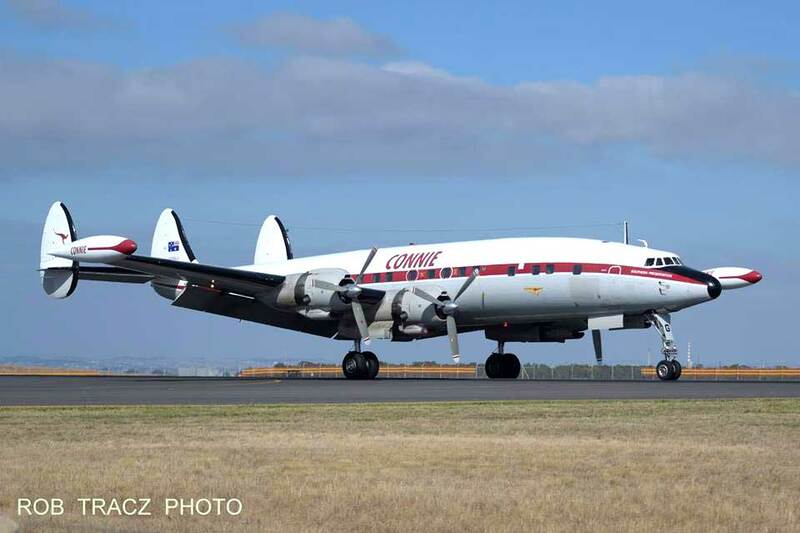 David Wood reported on Facebook today that Super Constellation N4247K safely arrived in Australia after an ocean journey from the Philippines. 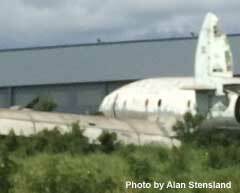 "The former USN C121G/ R7V1 c/n 4144 BuNo 131643 (N4247K) which had sat, abandoned, at Manila in the Philippines for many years before being acquired by the Qantas Founders museum, has finally reached Townsville in Queensland, Australia. 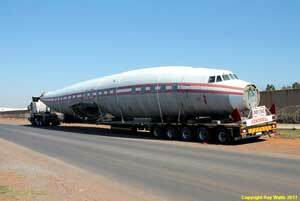 It will now be transported by road to the museum's premises at Longreach in central Queensland for restoration and assembly to static display. 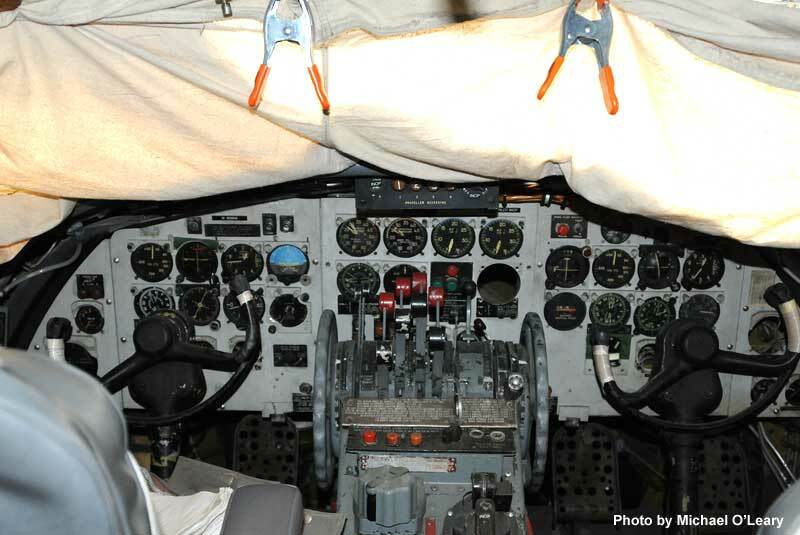 During the restoration process the museum plan to remove the round windows common to USN R7V1 Connies and instead fit square windows as fitted to C121C and L1049 passenger Connies. It will be painted to represent a Qantas Super Constellation." 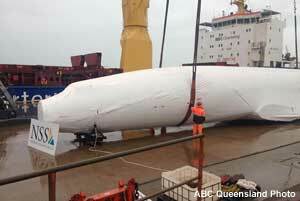 The adjacent photo shows the fuselage being unloaded from the ship in the Port of Townsville this morning. 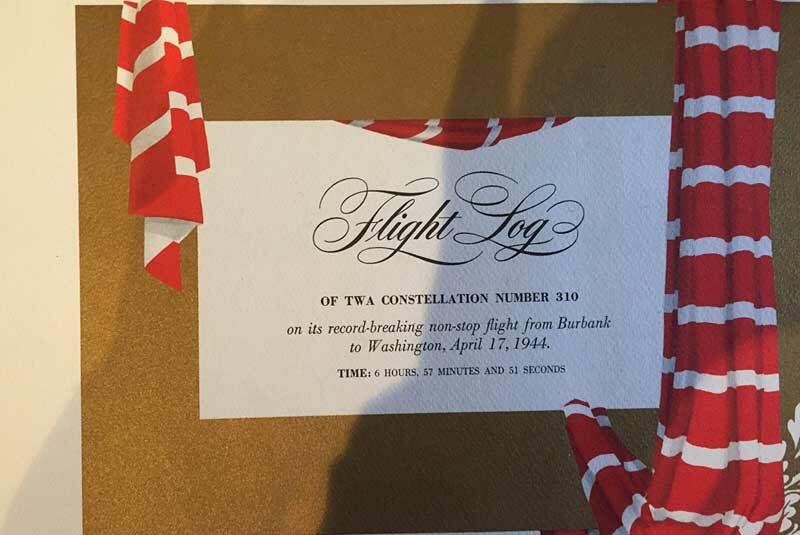 Larry Marechal’s father was a supervisor at Washington National Airport (DCA) on April 17, 1944 when Howard Hughes and TWA President Jack Frye made their record breaking non-stop flight from Burbank to Washington, DC in the second production C-69 Constellation 43-10310. 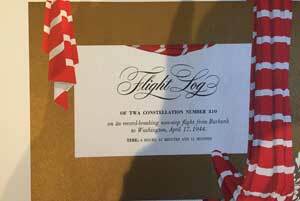 The aircraft was in full TWA colors with “The Transcontinental Line” and USAAF serial number markings. 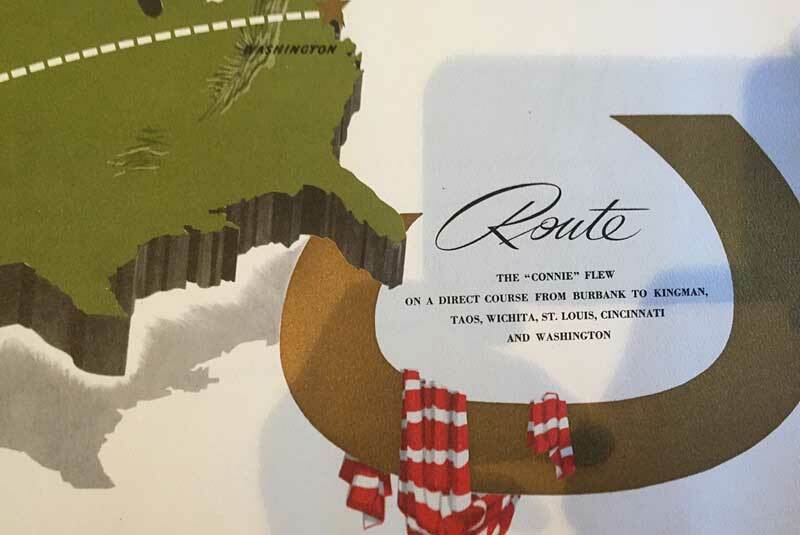 Larry has the navigator’s logbook and publicity material from the flight and he was kind enough to forward photos of these items. 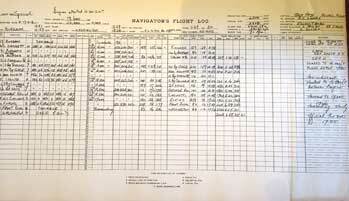 To read the logbook entries, click on the photo for a larger file. 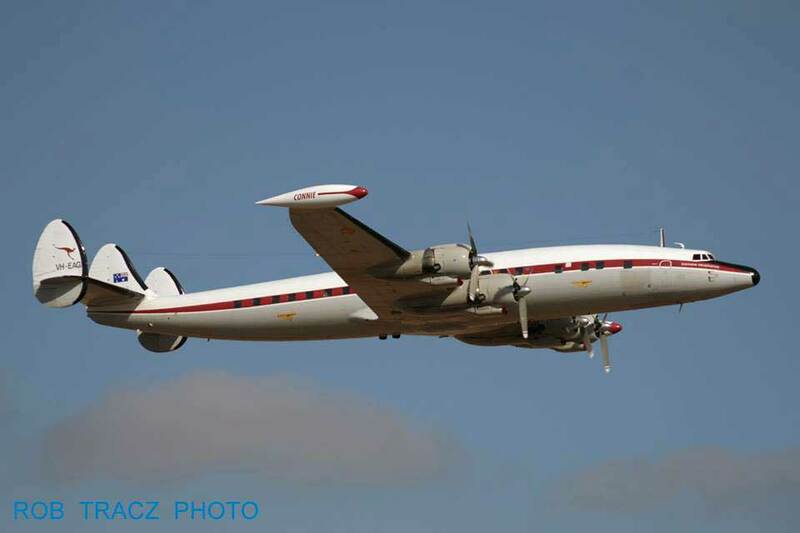 The folks at Amicale du Super Constellation are creating a media archive of their Super Constellation F-BGNJ and are searching for any (and all) media (photo, video, newspaper articles, anecdotes and any other miscellaneous information) relating to the aircraft. All items will be credited to the author and/or contributor and the organization is requesting they be submitted as donations. 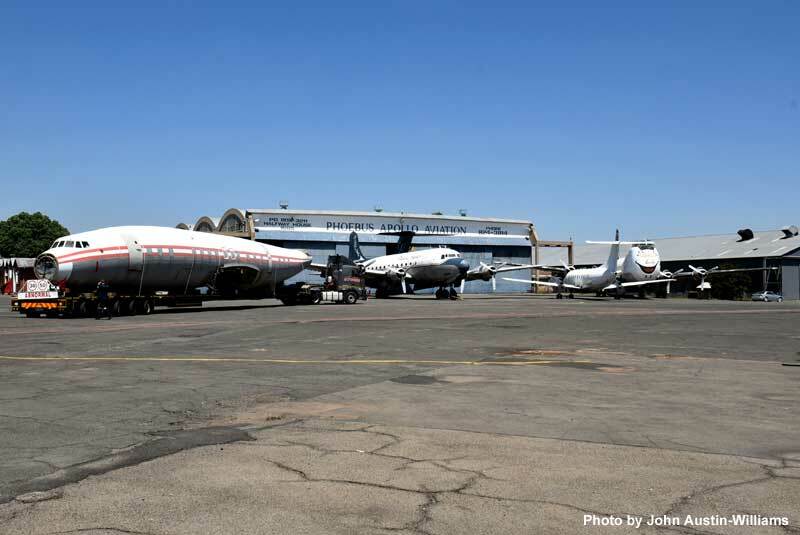 The goal is to create a large archive that would be available in media galleries on their website to preserve the memory of their aircraft, which carried the registrations F-BGNJ, EC-BEN and F-BRAD. 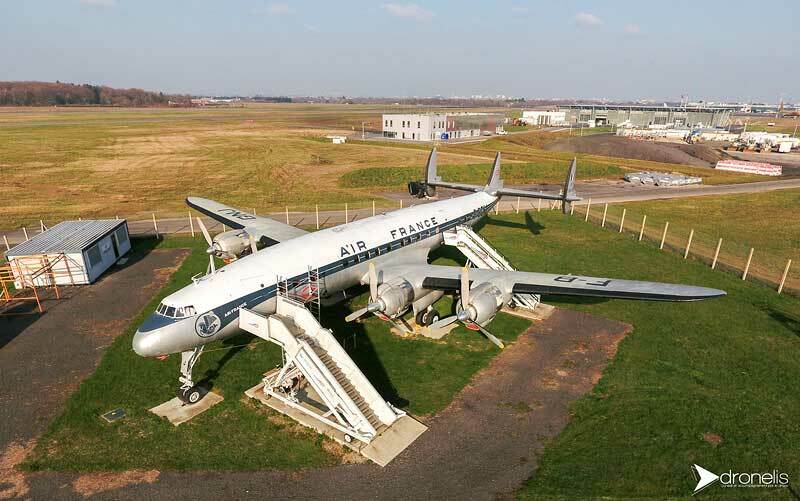 They also wish to preserve the memory of crewmembers and passengers who flew in the airplane from 1953 to 1974, while it was in service with Air France and CATAIR. 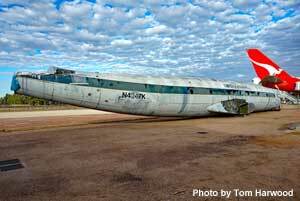 (While it was registered EC-BEN and painted in TAE colors, it never flew for the airline.) 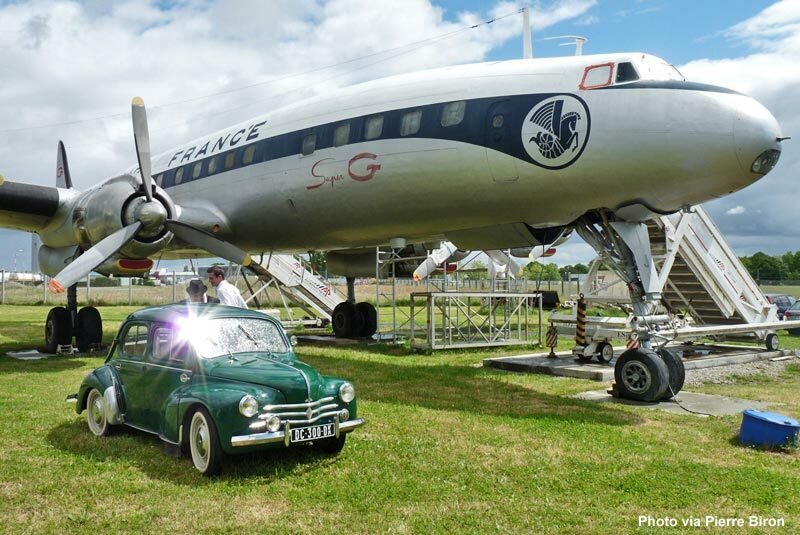 The organization would also very much like to capture the remembrances and photos from all those folks who have visited the aircraft since her flying days ended in 1974. The following information should be included in each submission. Angela Schmidt, who is a film archivist at the University of Alaska-Fairbanks Alaska Film Archives, sent me a link to a really interesting YouTube video of Starliner N7316C landing and taxiing in the far north back in the 1960’s, while in service with Alaska Airlines. The Alaska Film Archives at University of Alaska Fairbanks has just posted this video of Alaska Airlines Super Constellation N7316C landing in Kotzebue during the 1960s. 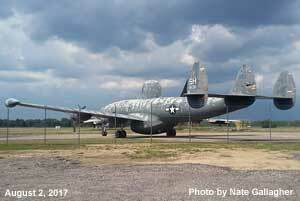 I ran across your site while looking for more information on the aircraft. 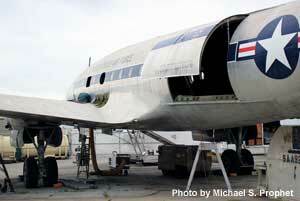 Are restorations efforts still underway on this Connie? Please feel free to link to this clip if it is of interest to you. Please let me know if there are any details I can add, clarify or correct in the summary of the film (see below) that will be useful to viewers. Thanks for all the useful information on your site! 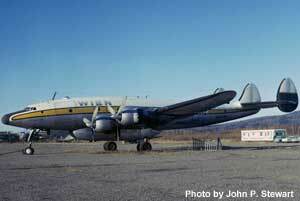 Description of video: Scenes of an Alaska Airlines Lockheed Super Constellation airplane (N7316C) landing and taxiing on a snowy runway at Kotzebue, in northwest Alaska, circa 1960s. Kotzebue is north of Nome and it sure looks desolate. 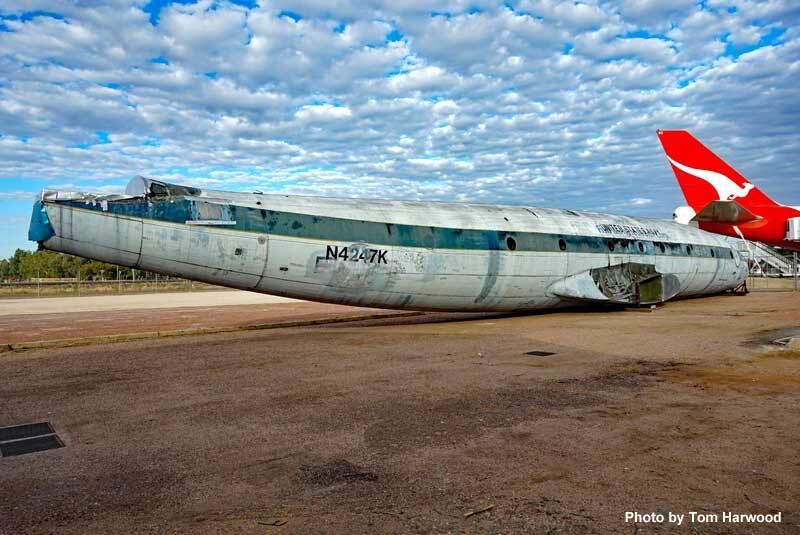 I wonder if Alaska Airlines ran a scheduled service there or if this was just a charter flight. Anyhow, this short video preserves a fascinating snipit of both Alaskan and Constellation history. Thanks much to Angela for sending the video my way. 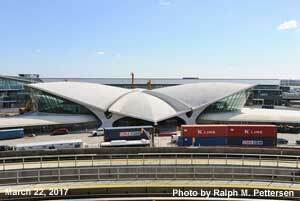 The Port Authority of NY & NJ has struggled with how to best repurpose JFK's iconic TWA terminal since that airline ceased operations in 2001. 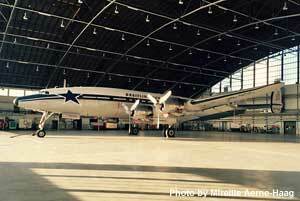 Designed by famed architect Eero Saarinen and completed in 1962, the National Park Service listed the building on the National Register of Historic Places in 2005. 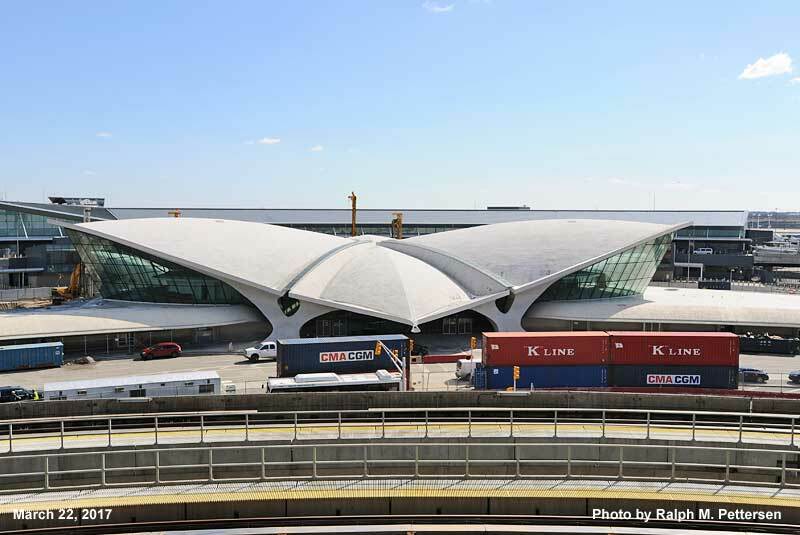 Having avoided the fate of the equally iconic Pan Am terminal that was torn down in 2013, the empty terminal was allowed to stand while the powers-to-be pondered their options. It is now surrounded by the Jet Blue terminal that was completed in October 2008. On March 7, 2017 Tyler Morse of MRC Development presented that company’s plan for the redevelopment of the building into a hotel. The plan includes a Super Constellation that will be transformed into a restaurant and bar and parked in front of the terminal. 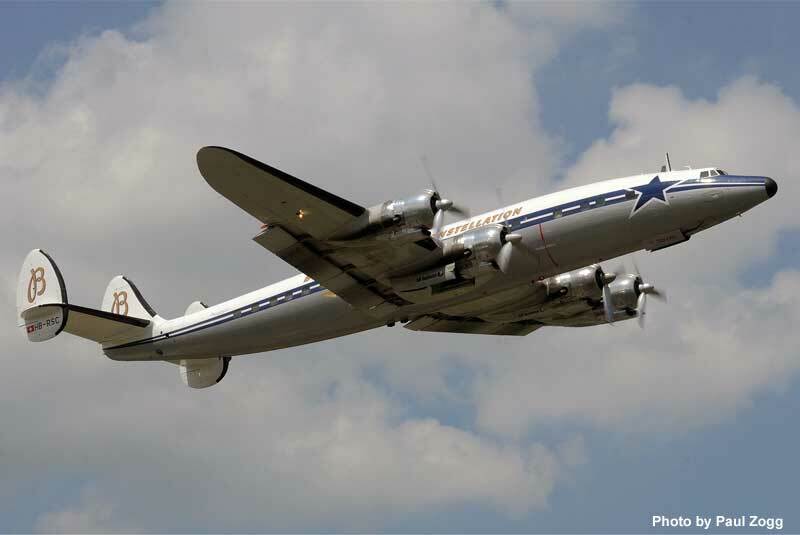 The presentation gave no hint as to the identity of the Super Connie but the list of available airframes is pretty small and I’m guessing it might be L1649A Starliner N8083H. 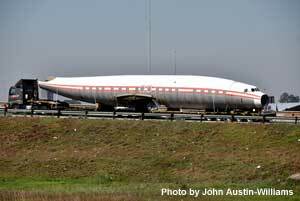 This aircraft was one of two Starliners once owned by Maurice Roundy and parked in front of his house at Auburn-Lewiston Airport in Maine. 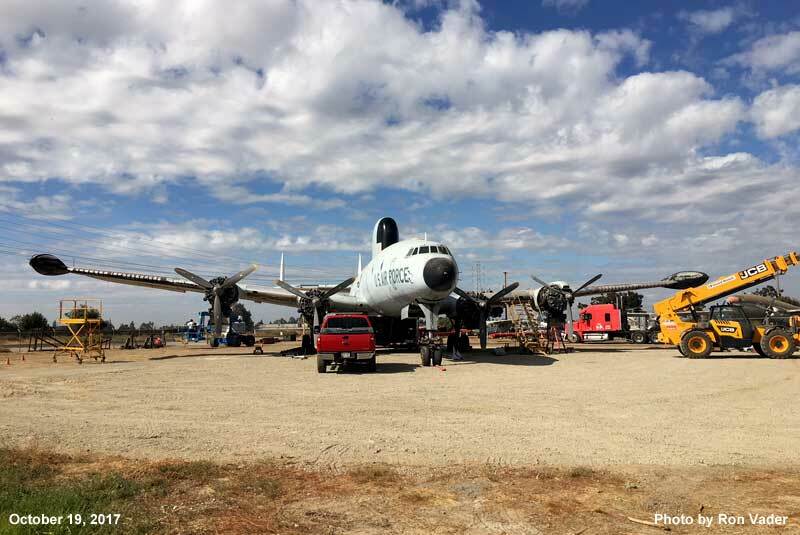 The other (N7316C) is nearing the end of a comprehensive rebuild by Lufthansa Technik in Auburn and N8083H has been parked outside the restoration hangar since 2008. While it has been used for spares and is not complete, it could be made externally complete and would make an ideal candidate for the proposed restaurant/bar. Having missed out on Jim Flannery's Restaurant in Penndel, Pennsylvania, I definitely plan on having a drink at the bar once the project is completed. 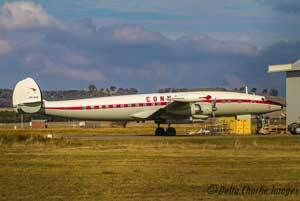 As to what Super Connie will be used for the project, only time will tell and I will report it's identity on this website as soon as I know. 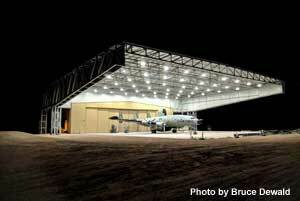 For additional information about the project, check out this link . 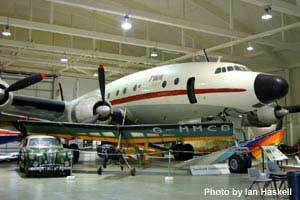 "My parents Don and Jacquie Gilbertson purchased N7777G from KLM in 1963. 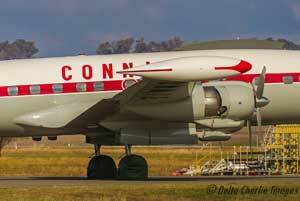 It was parked in Costa Rica with a whole fleet of Connie's. My dad spent three months getting it ready to ferry north and part of the deal was newly overhauled engines and a heavy check. 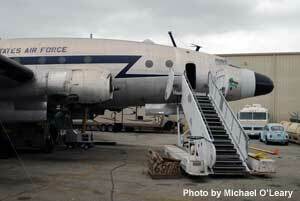 It had a cargo door in the front and Wien Alaska had a U.S. Navy contract for it. 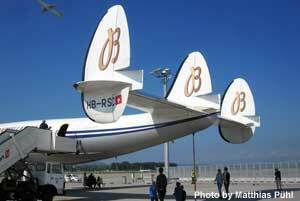 My dad had flown for Wien for several years and my parents leased it to Wien. 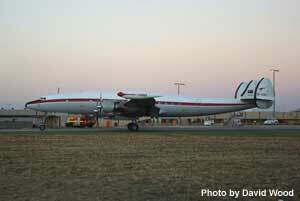 He flew the Connie up to Long Beach after getting a one hour check out by a KLM pilot. 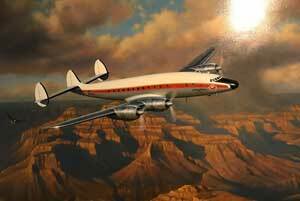 He and Merrill Wien then flew it to Fairbanks. Merrill is still alive and remembers the trip well. I thought I would mention as it is a little more history on the old girl. 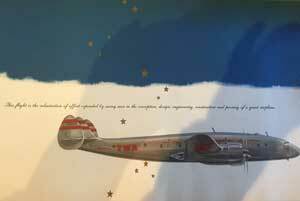 Stan Stokes painted me a beautiful picture of it a few years ago with the Rolling Stones logo on front." 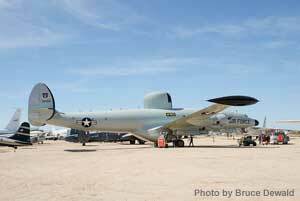 For a detailed history of the aircraft, check out the The Lockheed File. 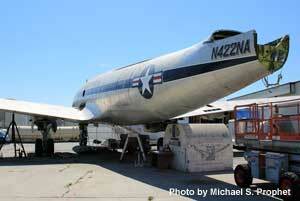 Photos below include the painting by Stan Stokes; the aircraft in Wien colors in 1968; and at the museum in 2004. 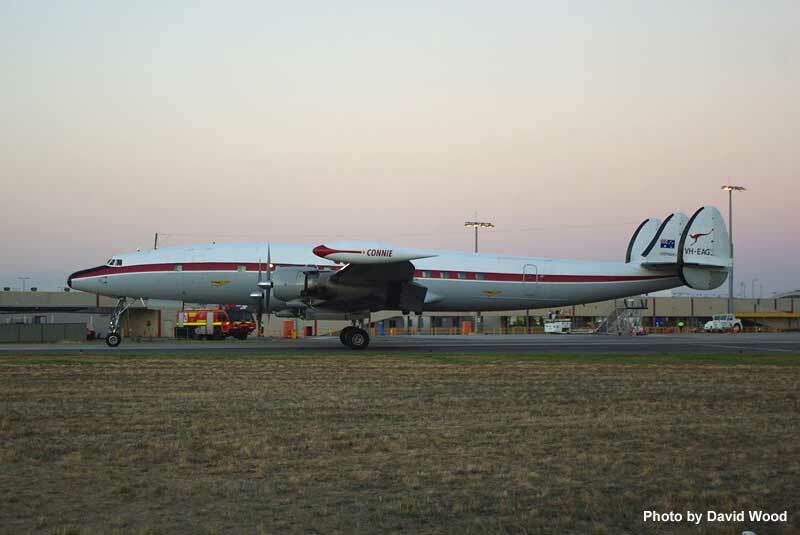 Hard to believe but its been over 22 years since the HARS Super Connie was painted in November 1994 by the good folks at the Lockheed Aeromod Center in Tucson. 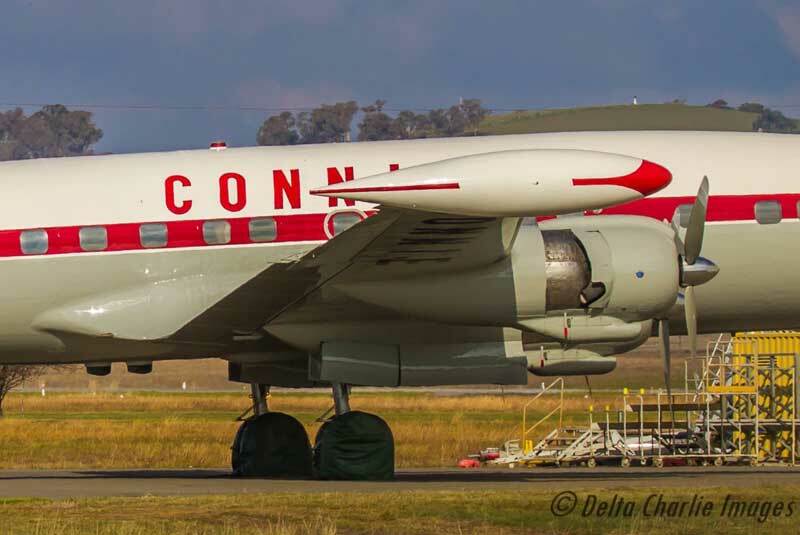 Constellation VH-EAG made her successful trans-Pacific flight to Australia 15 months later and has been entertaining airshow crowds and museum visitors ever since. 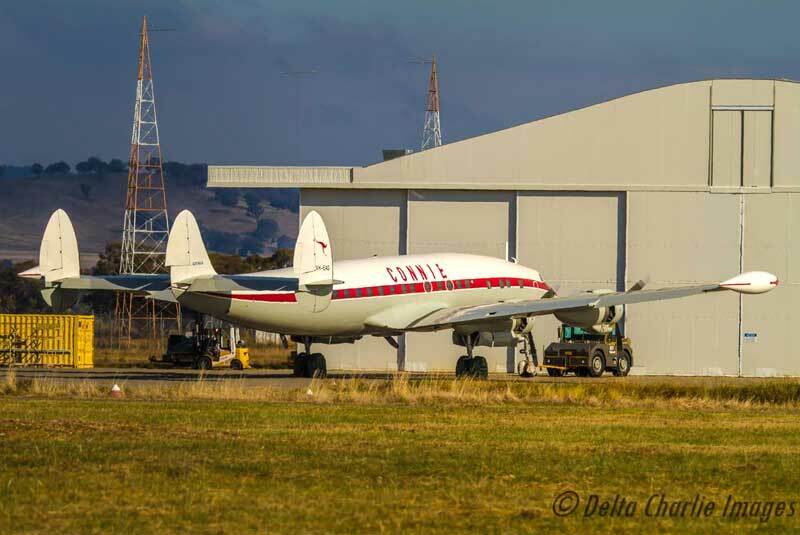 The Super Connie attended the 2017 Australian International Airshow at Avalon Airport last weekend and departed soon after the show ended for the Douglas Aerospace paintshop in Wagga Wagga. 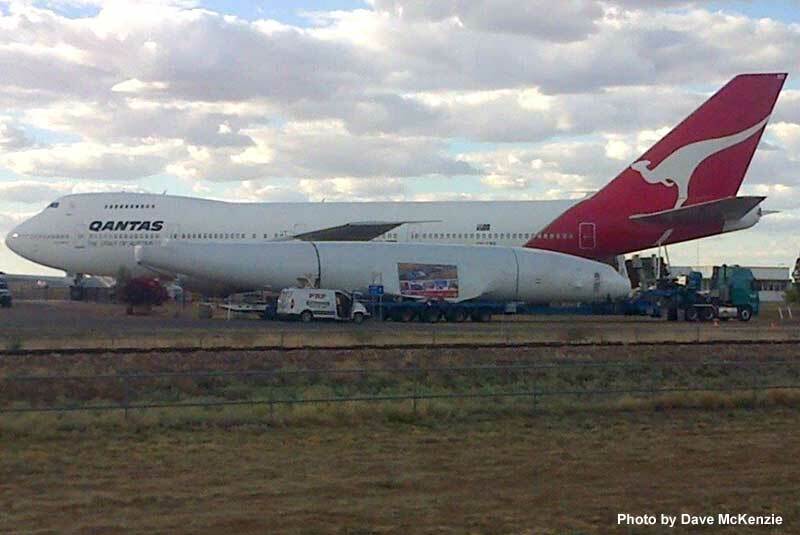 It would be very nice if the lawyers allowed HARS to include Qantas titles on the aircraft but that's probably too much to expect. 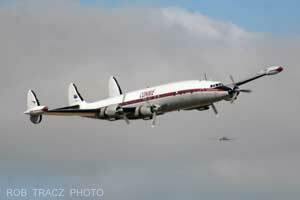 Many thanks to Rob Tracz and David Wood for allowing me to include their photos of VH-EAG taken at the airshow. 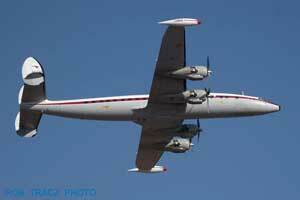 Also, here’s a very nice video of the Super Constellation doing some fly-bys at dusk during the airshow. 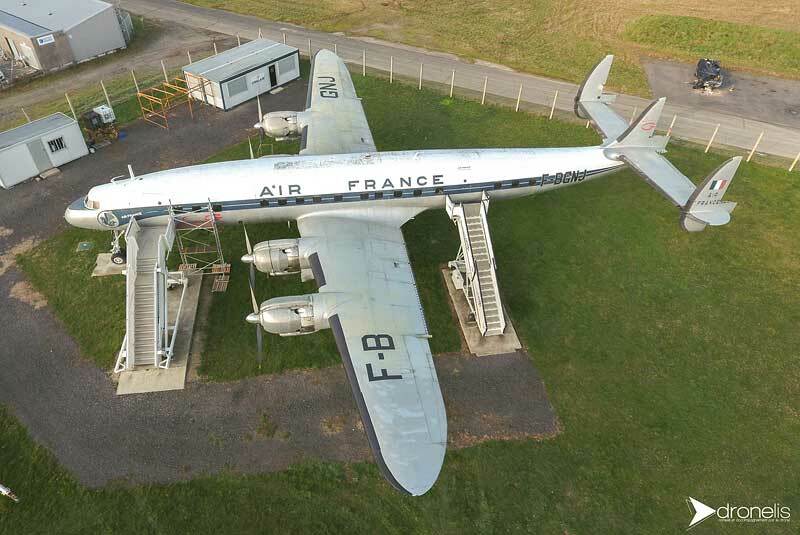 Pierre Planel sent me some interesting photos of Super Constellation F-BGNJ taken from a drone. I normally only post photos on my Photos Page but these are the first drone photos I've received and I consider them indeed newsworthy. 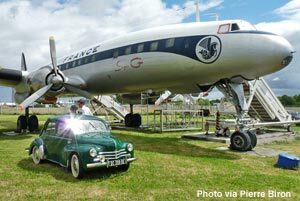 The aircraft is owned by Amicale du Super Constellation and is on display at Nantes Airport in France. 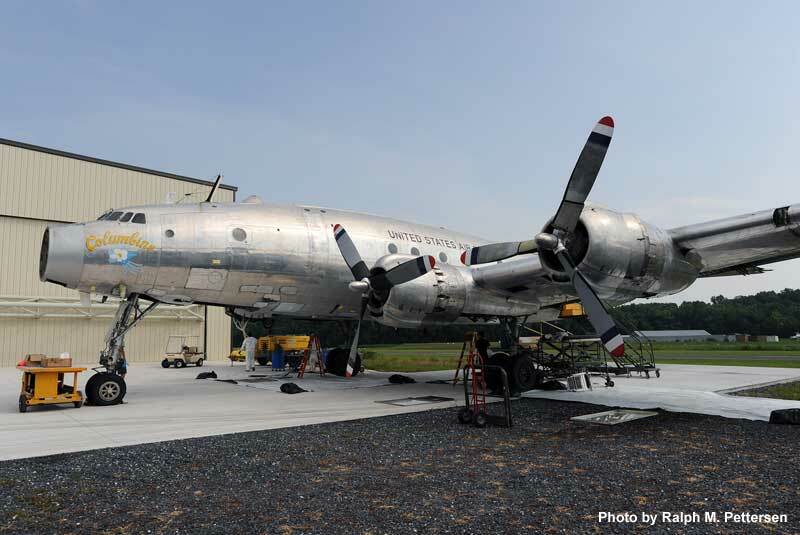 Over the years the group has spent a lot of effort restoring the aircraft and proudly displays her to the general public during regular open houses. 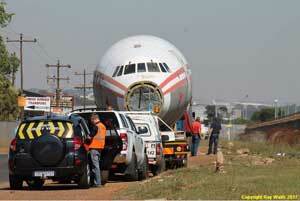 Work it set to resume on the disassembly of L1649A ZS-DVJ at OR Tambo Airport in Johannesburg, South Africa. 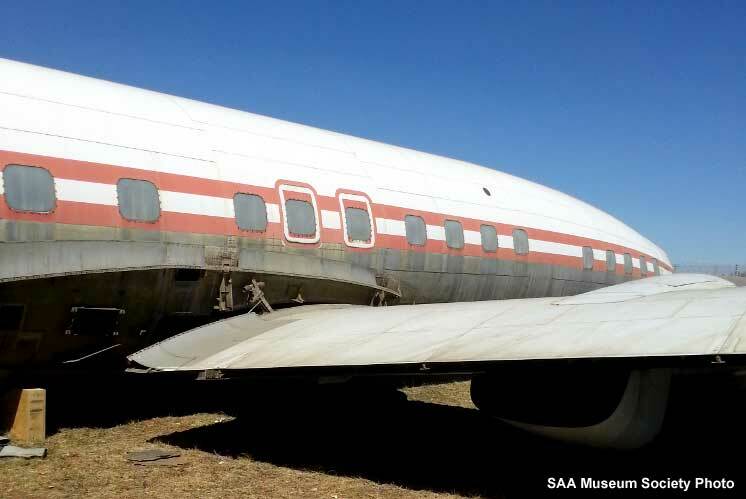 The aircraft is owned by the South African Airways Museum Society (SAAMS) and disassembly began in mid-2011 with the intent of moving the aircraft by road to the museum’s home base at nearby Rand Airport. Unable to continue the disassembly at the SAA facility, the aircraft was towed across the airport to Denel Aviation on May 12, 2012. 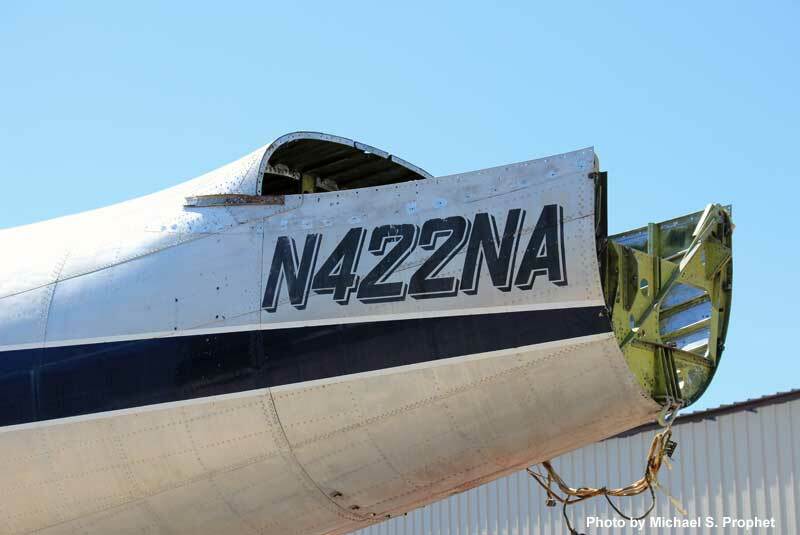 Disassembly continued in 2013 and into 2014 with the engines, empennage and other components being removed and transported to Rand. The story continues on the museum’s website....On 13 August 2013 work began on the removal of the Starliner engines. 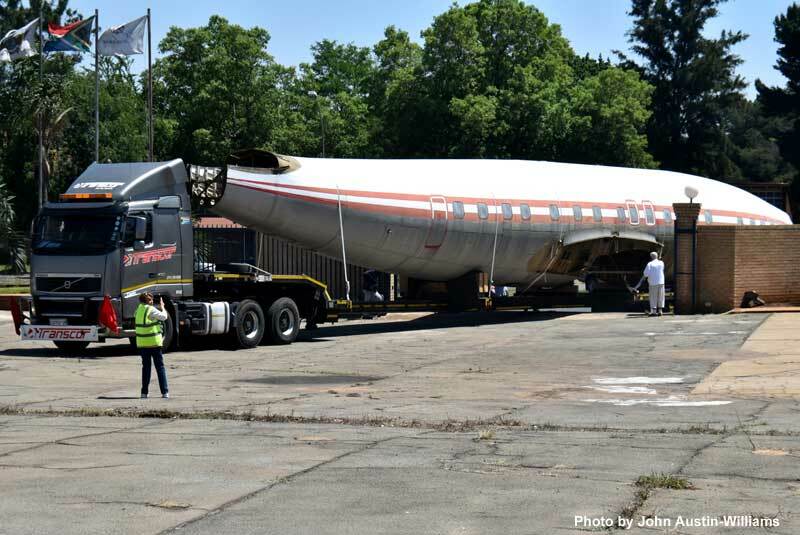 The four engines were sent to Anderson Aeromotive based in Grangeville, Idaho, USA, for potential overhaul and/or the recovery of components suitable for overhaul for the Deutsche Lufthansa Berlin-Stiftung (DLBS) Starliner N7316C which was being restored to flying condition in Maine USA. 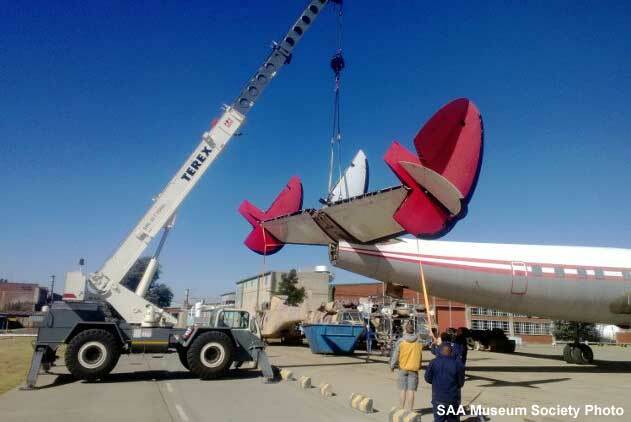 The SAA Museum society received dummy engines in return to install on ZS-DVJ once she is at Rand Airport. 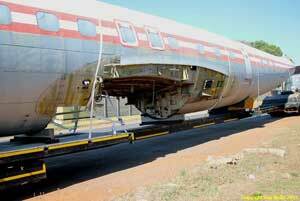 On 18 February 2014 the go-ahead was given by the Museum for Airside Enterprises (Pty) Ltd to manufacture fuselage shoring, consisting of rigging equipment, wing cradles and belly cradle. 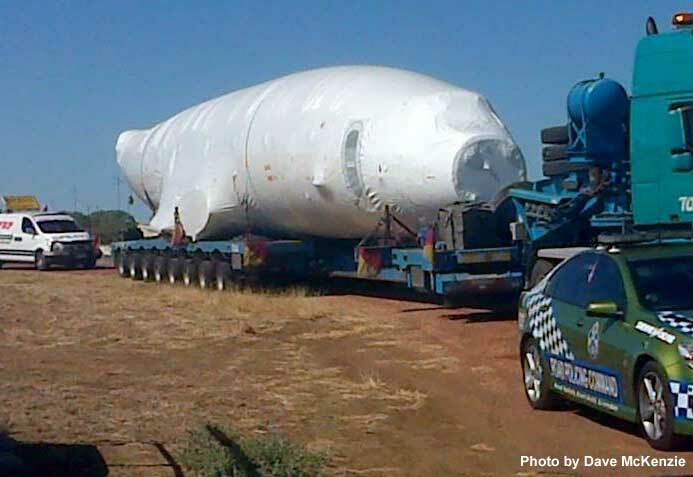 The items were duly manufactured in 2014 and stored. 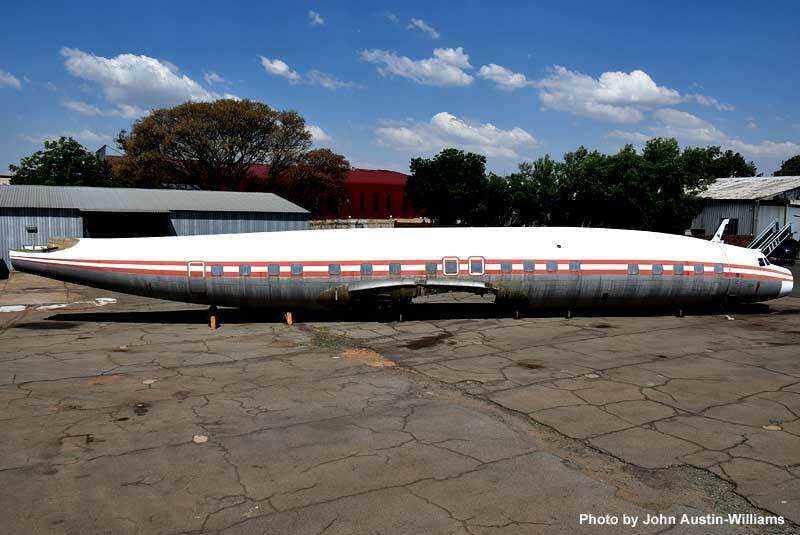 No further progress was made with the Starliner during the rest of 2014 as well as 2015 and 2016 as it was decided to work on relocating the museum's Vickers Viking, ZS-DKH, from OR Tambo to Rand Airport. 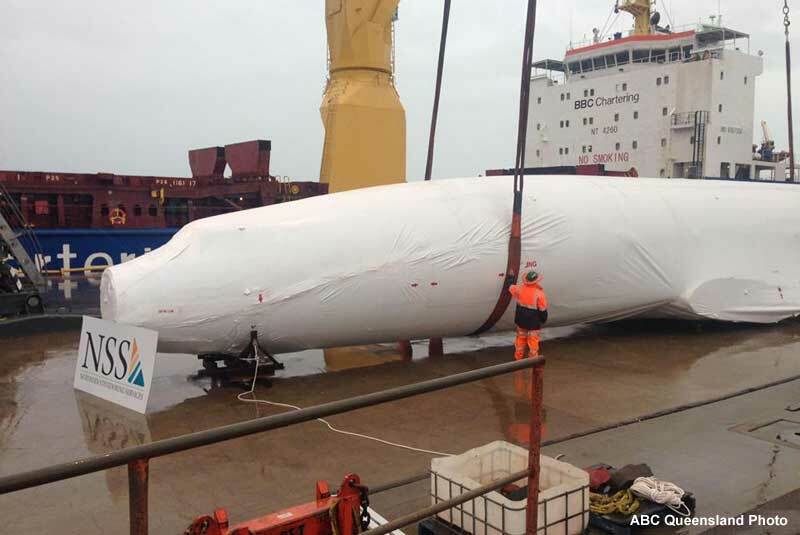 The Viking was relocated on 22 January 2017. 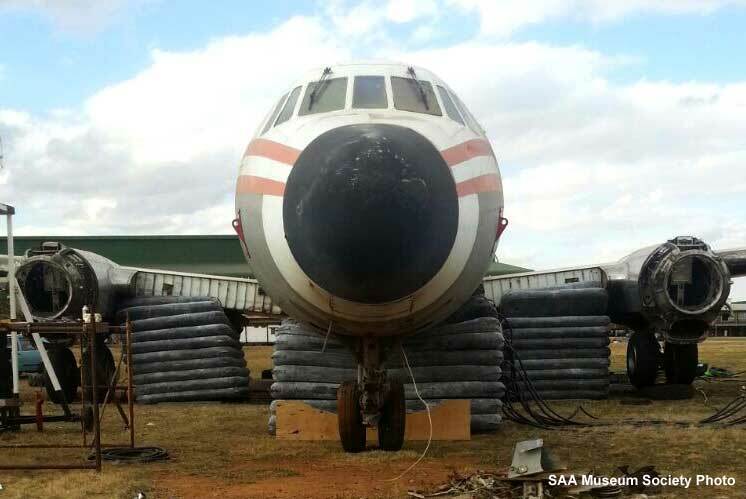 And so it was that on 17 February 2017, the man who had successfully headed up the Viking move, Matt Harvey, found himself at Denel Aviation listening to Richard Hunt explaining how to "take apart" the Connie and move it to Rand Airport. The task ahead was major; the Viking move had acted as a rehearsal and Matt and his team had some insight as to what lay ahead - albeit on a much larger scale. In addition to Mat and Richard, other team members present on 17 February included Ray Hudson, Ken Wadmore, James Engels, Kyle Baytopp, Keith Lennard, Mike Paterson, Digby Sherwood, Ian Cruickshank, and John Austin-Williams. 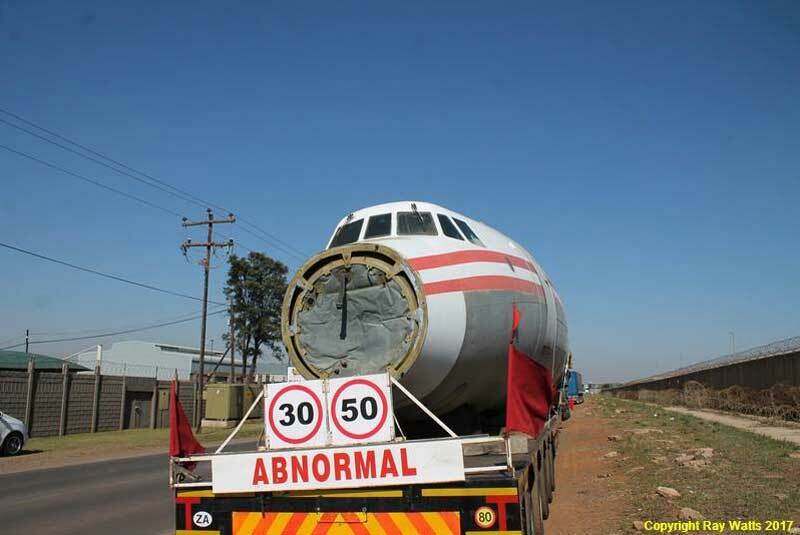 This will be the second road trip for the aircraft…its first was from Warmbaths to Johannesburg in May 1979. I wish the folks at the SAA Museum luck in their ambitious endeavor and will be posting updates on the project. 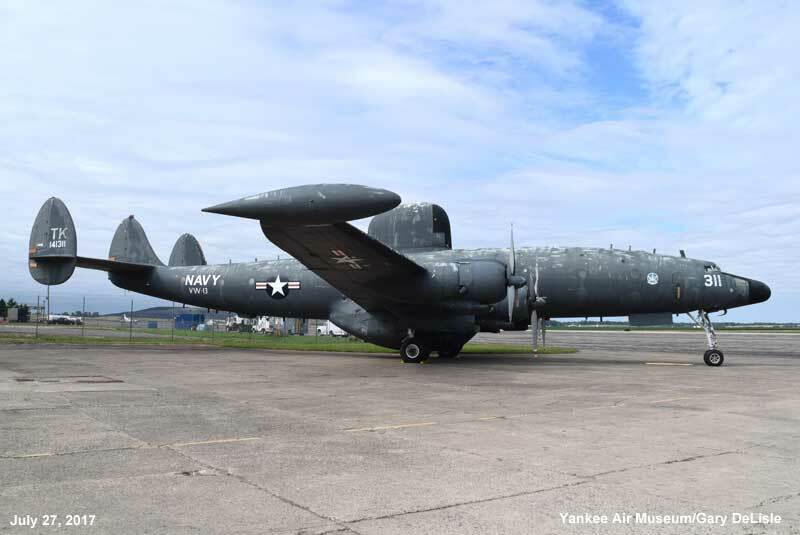 As reported on this website on October 25, 2016, the Yankee Air Museum in Ypsilanti, Michigan has acquired EC-121K BuNo 141311 that had been on display at the defunct Octave Chanute Museum in Rantoul, IL. 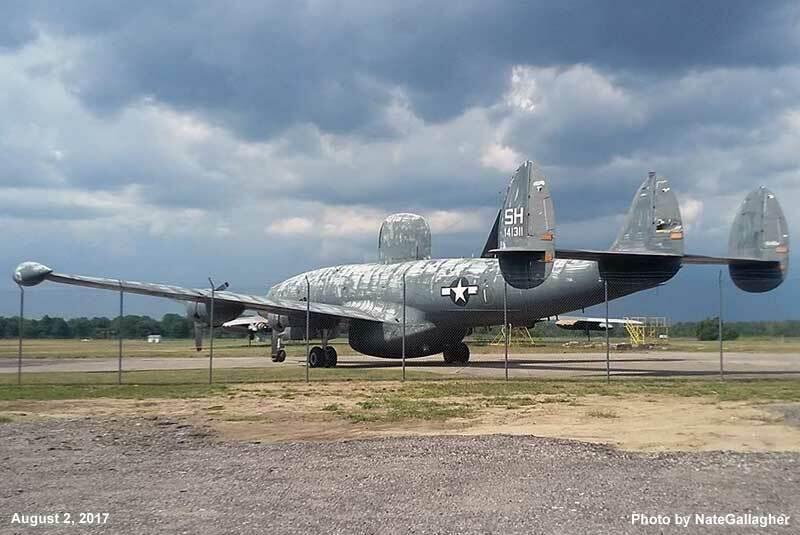 There had been quite a bit of concern that this aircraft would be scrapped but the folks at YAM stepped up and made a commitment to save the aircraft and move it to their facility in Michigan. This of course is going to take money and the museum recently added a page to their website soliciting donations for this very worthwhile project. 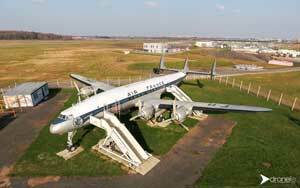 I wish them all the luck with the move and look forward to seeing the aircraft on display in their new facility. 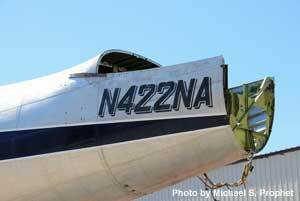 Rob Stanton recently sent me a short email and photo of the forward fuselage section of NC-121K BuNo 141292. 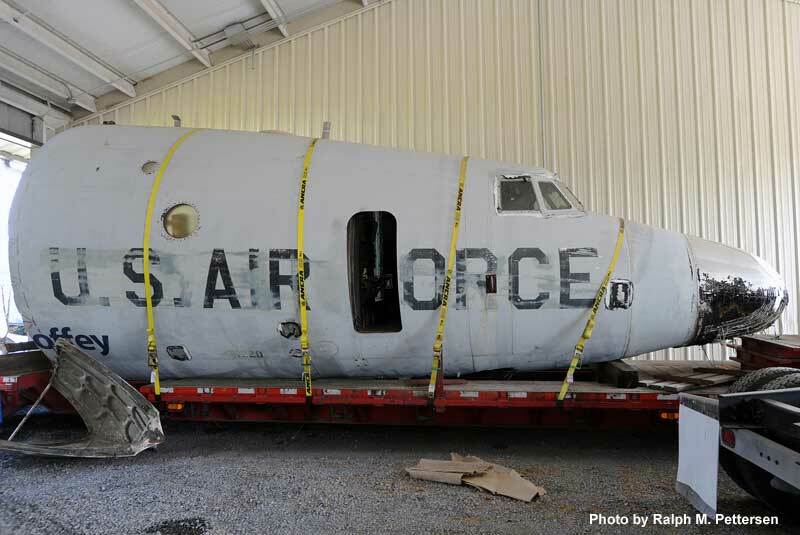 This aircraft made the last U.S. military Constellation flight on June 11, 1982 and was donated to the Florence Air and Missile Museum in Florence, S.C. for static display a few weeks later. 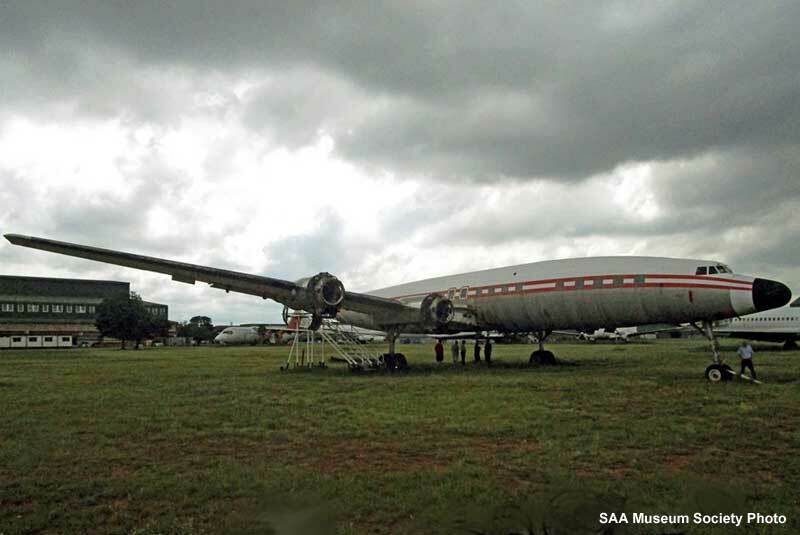 The museum closed in September 1997 and the aircraft was disassembled with the forward fuselage going to Brian Hicks and the engines, propellers, landing gear, rear cargo door and other parts going to the AMC Museum for the restoration of L1049E N1005C. 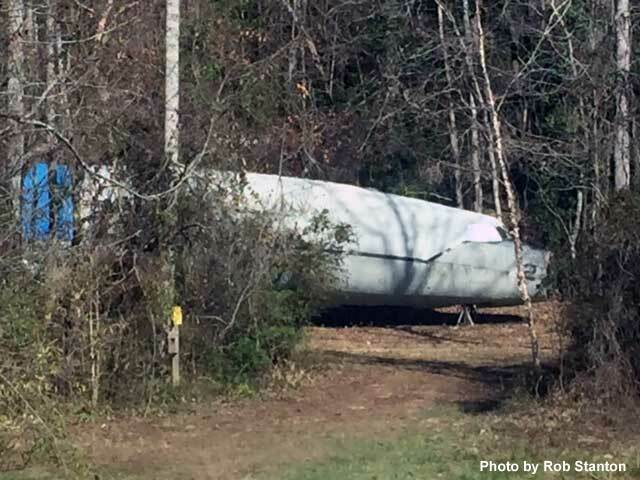 Rob stated in the email that the aircraft is located on Alexis High Shoals Road in Dallas, N.C. and the photo was taken on February 11, 2017. Previous reports have the aircraft in nearby Stanley, N.C. and I’m curious to know if the airplane has been moved. Can anyone confirm?